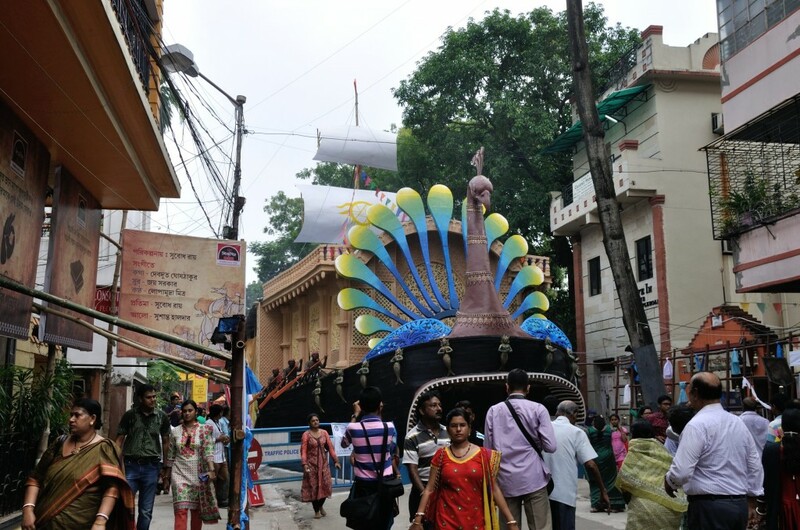 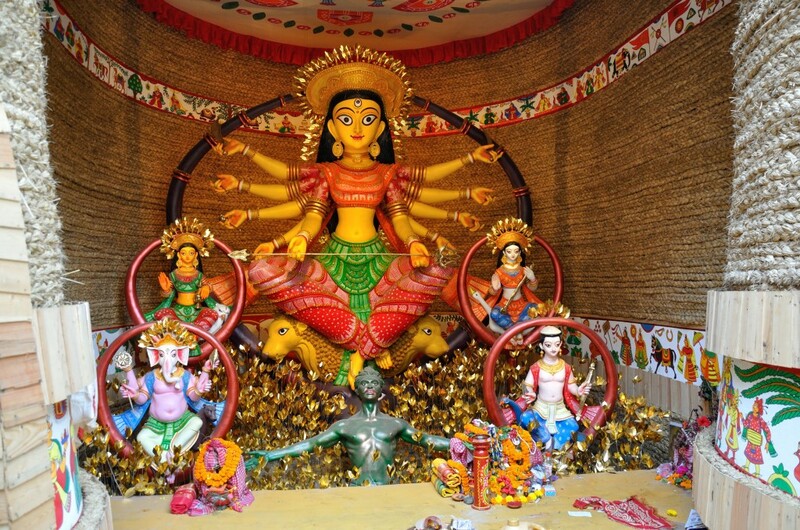 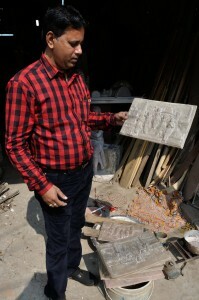 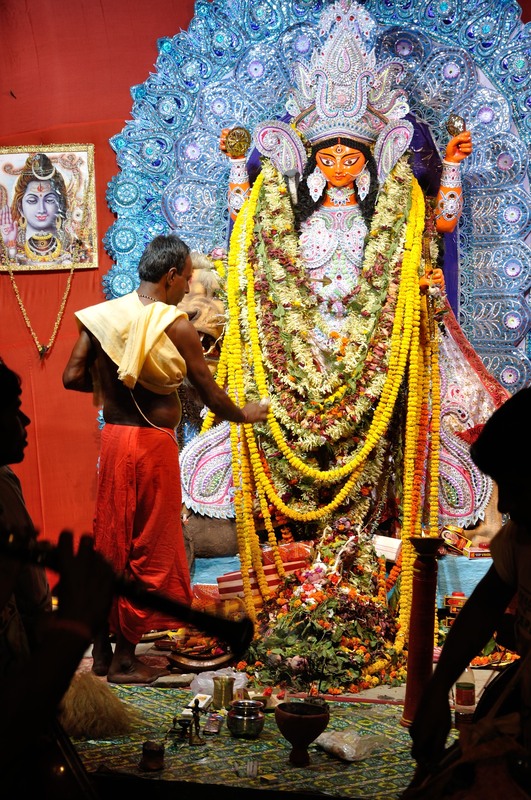 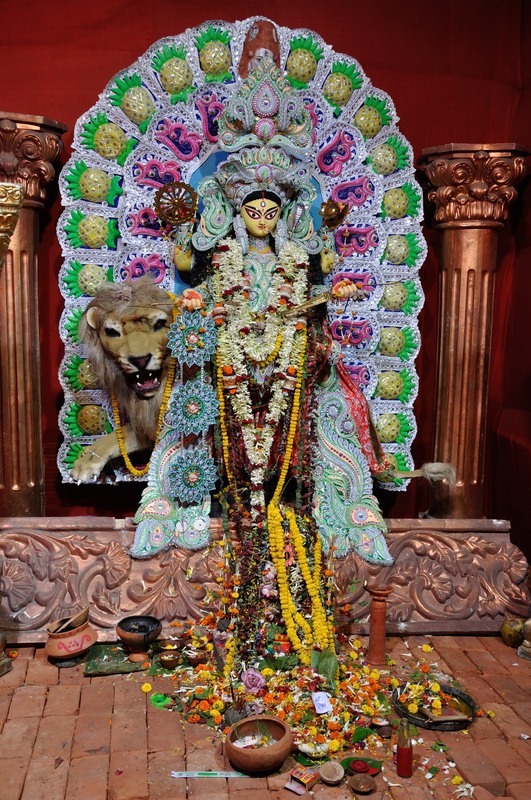 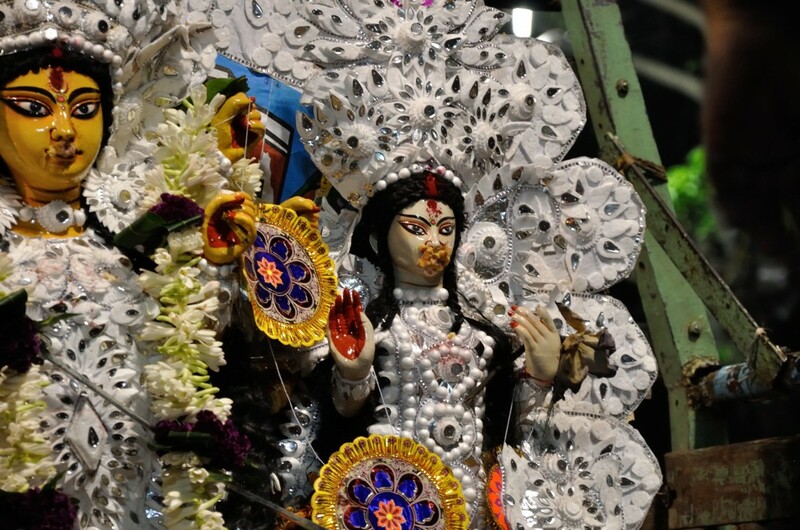 Dilipda is preparing no less than five images for Jagadhatri Puja, which is celebrated throughout West Bengal and parts of Odissa about one week after Kali Puja (late October to early November) and exactly one month after Durga Puja. 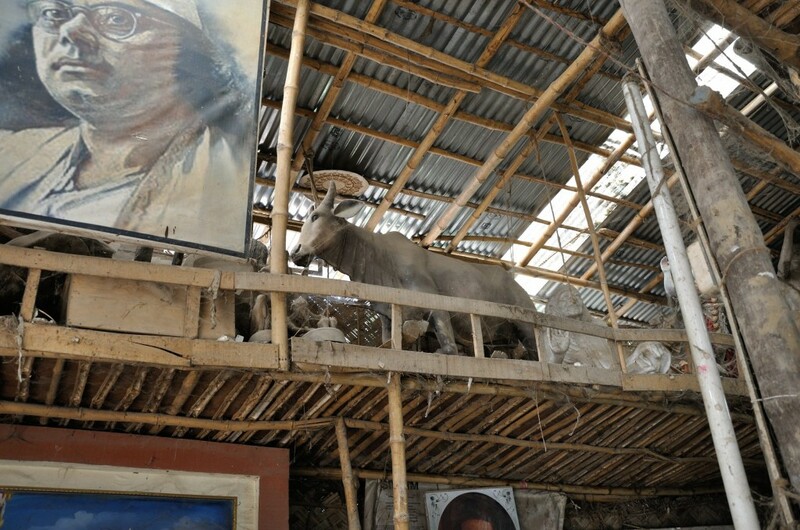 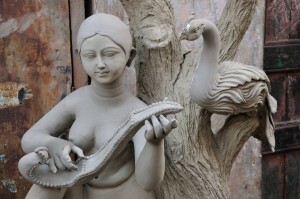 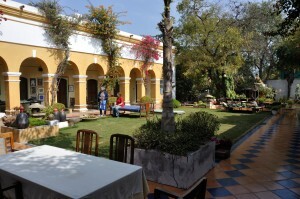 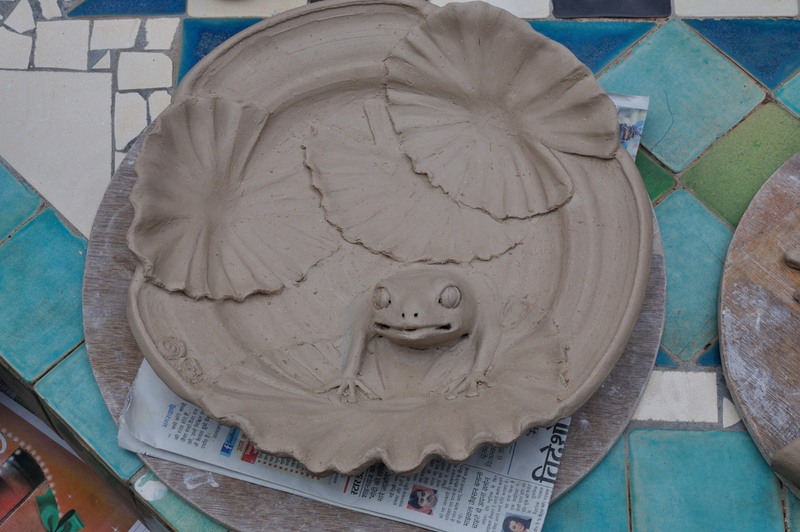 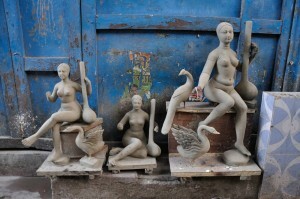 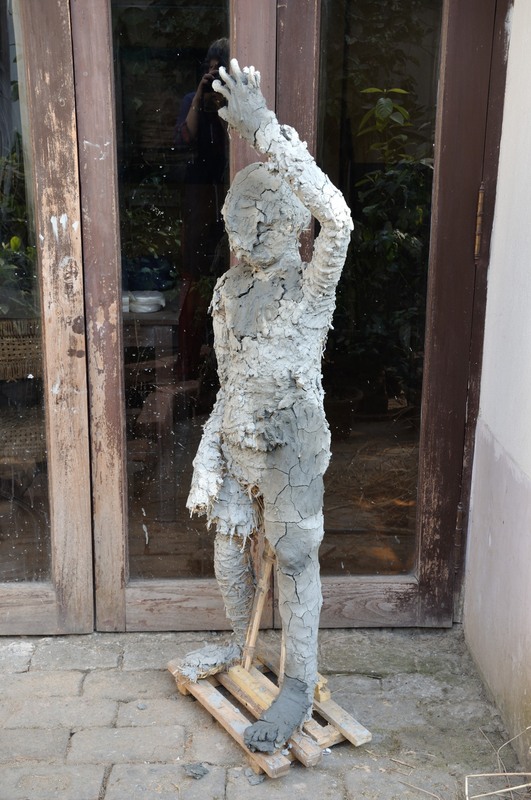 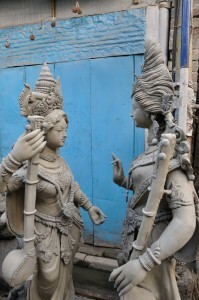 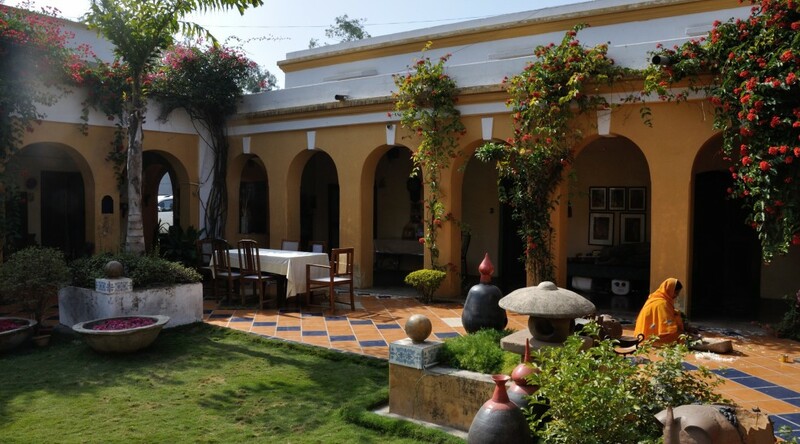 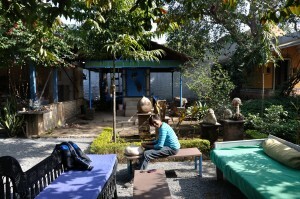 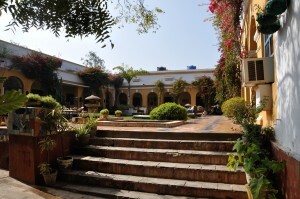 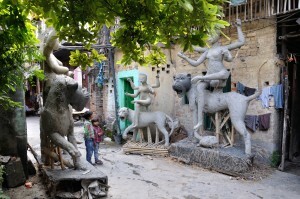 The courtyard outside of Dilip Pal’s Kumartuli studio, where he prepares images for Jagadhatri Puja. 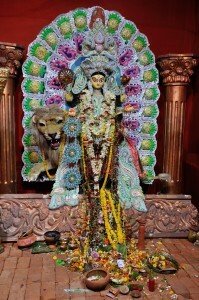 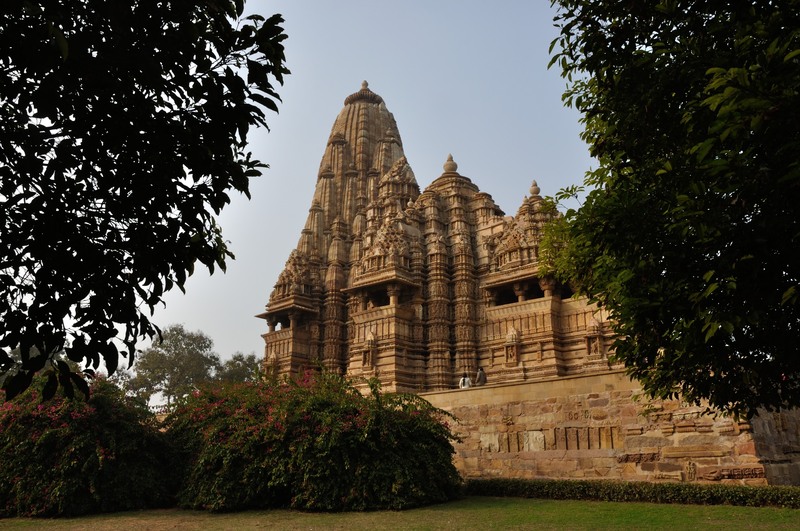 Jagadhatri is considered to be a calm incarnation of Durga. She is known as the “Holder of the World,” and it is believed that if Jagadhatri is not there, the world will fall down! 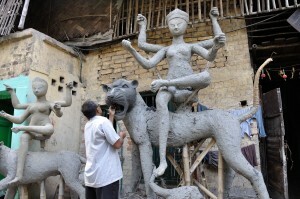 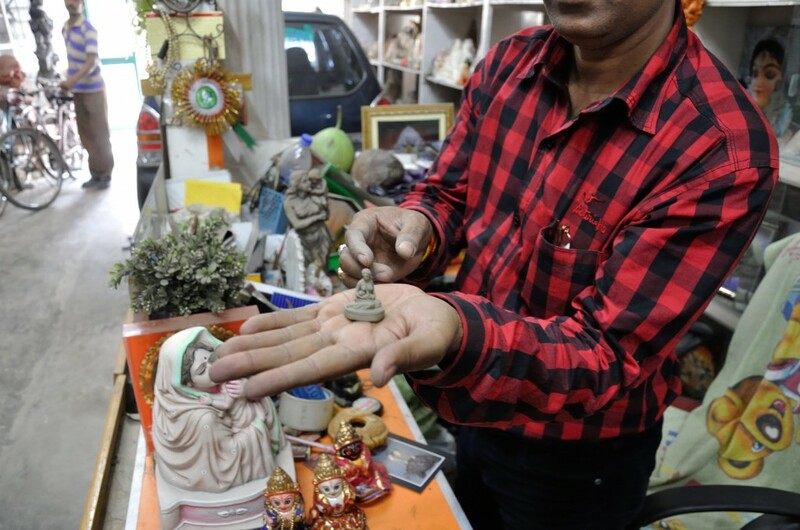 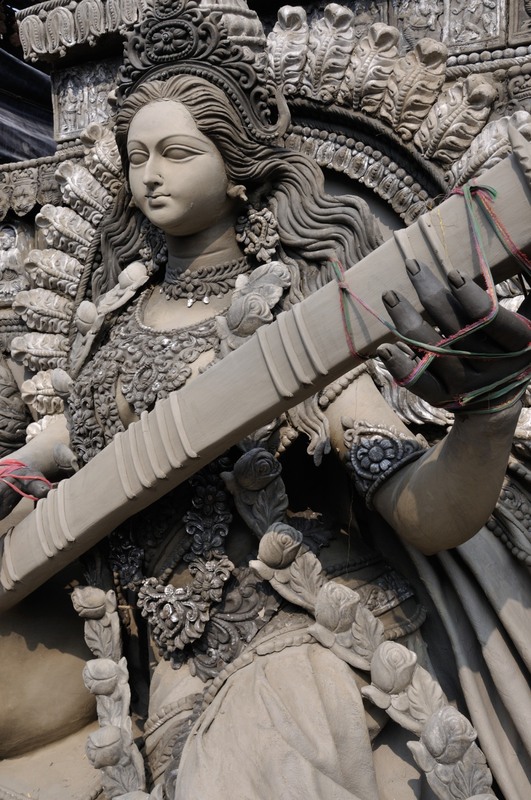 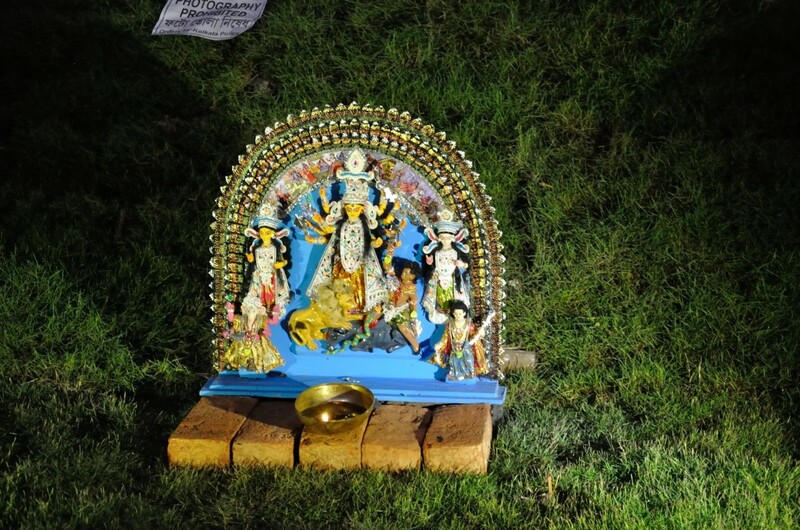 The origins of Jagadhatri Puja are unclear. 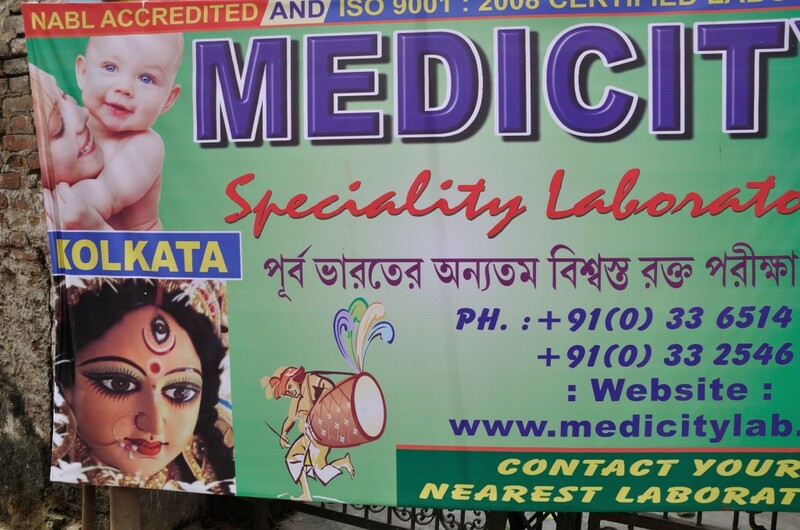 One account is that the puja was founded by Sarada Devi, the wife of Ramakrishna. 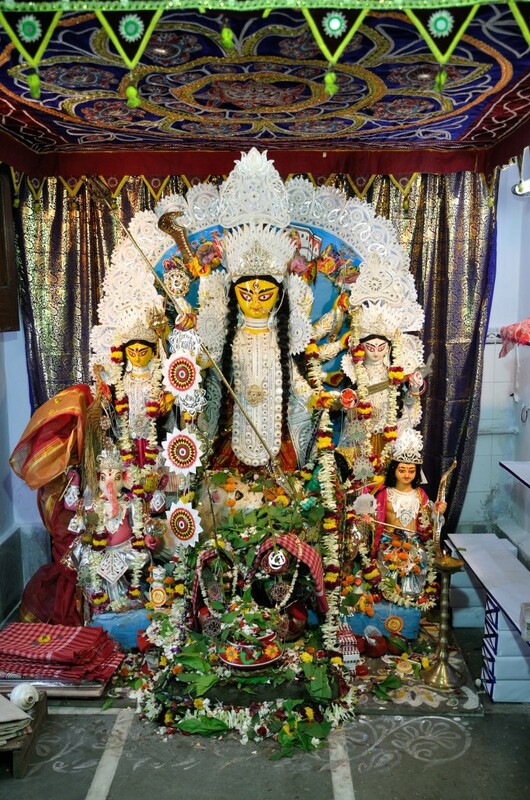 Jagadhatri celebrations are observed today with great joy in Ramakrishna missions around the world. 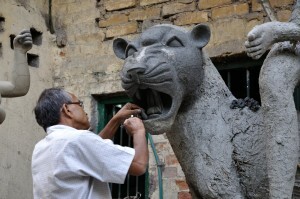 Today, Dilipda is amusing himself by repeatedly telling me that he is “The Dentist To Lions,” as he finely sculpts each feline’s memorable dentition. 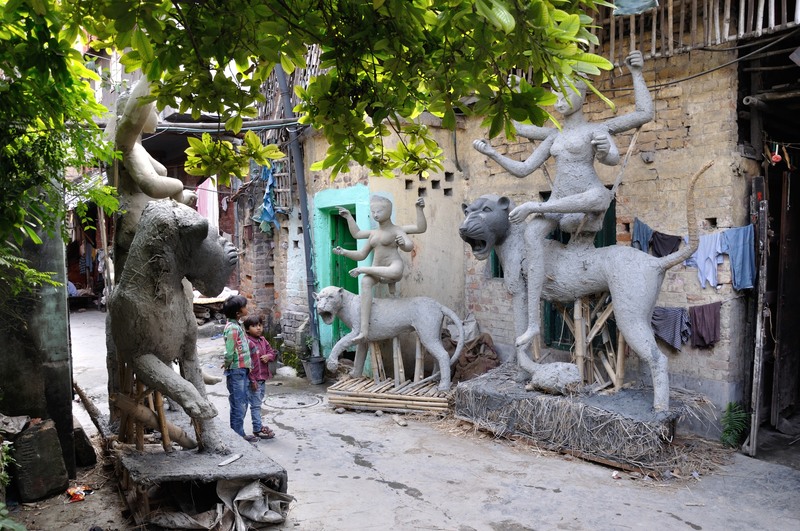 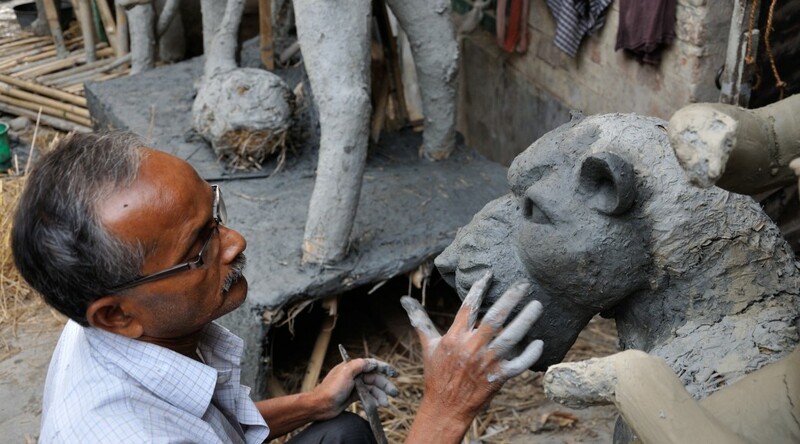 In researching Jagadhatri’s history and observing the images of many Kumartuli workshops, I saw reference to both lions and tigers. 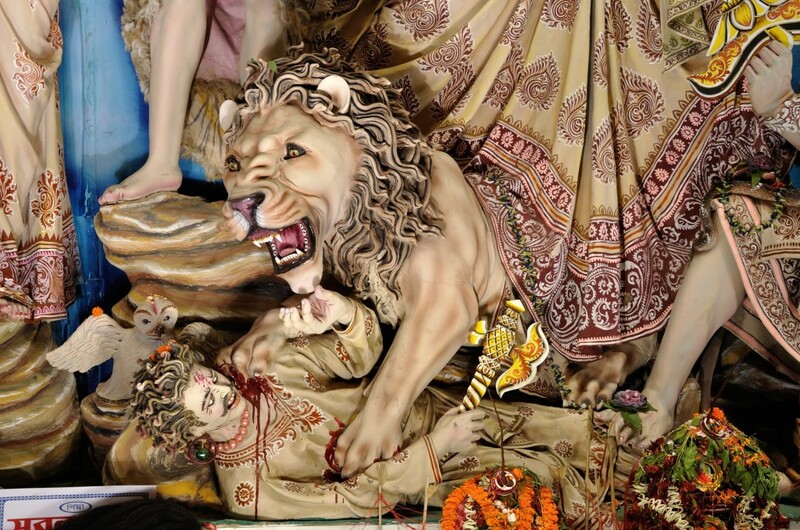 In addition to being accompanied by a lion/tiger, the three-eyed Jagadhatri is described as being the color of the morning sun. 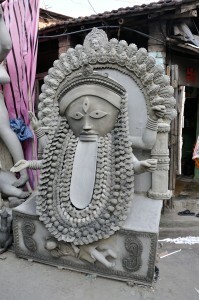 She holds a conch and a bow in her two left hands and a chakra and a five-headed arrow in her two right hands. 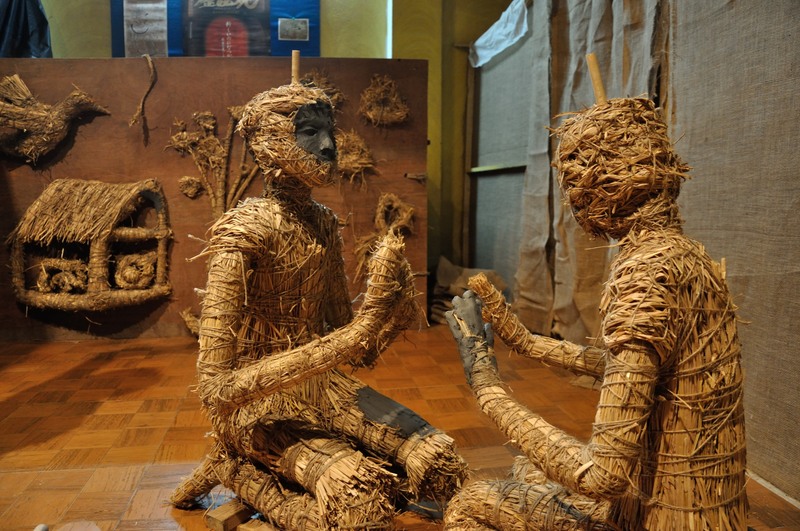 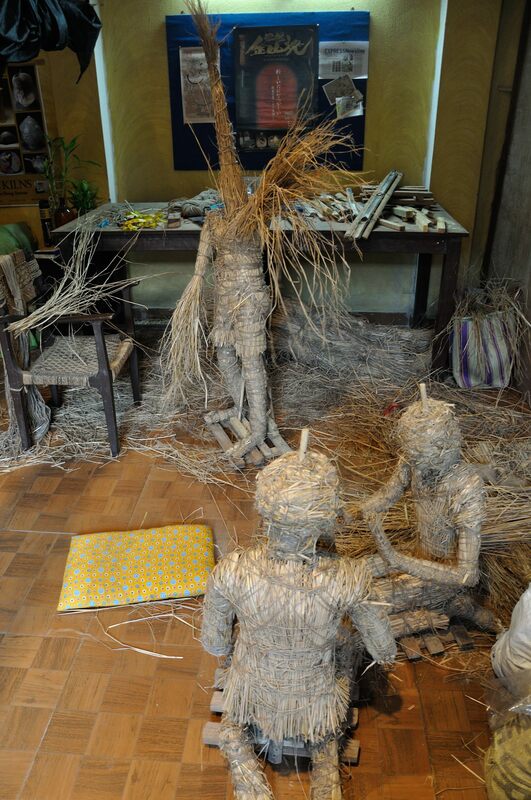 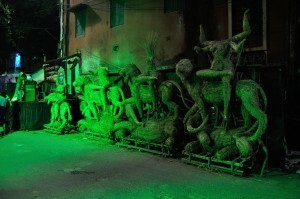 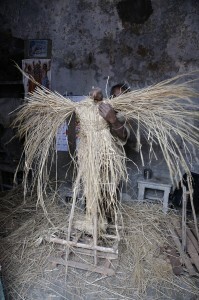 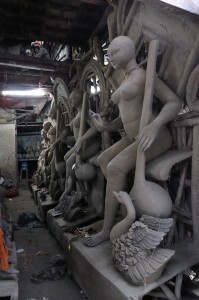 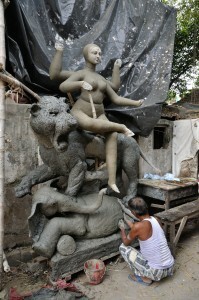 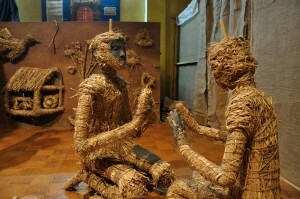 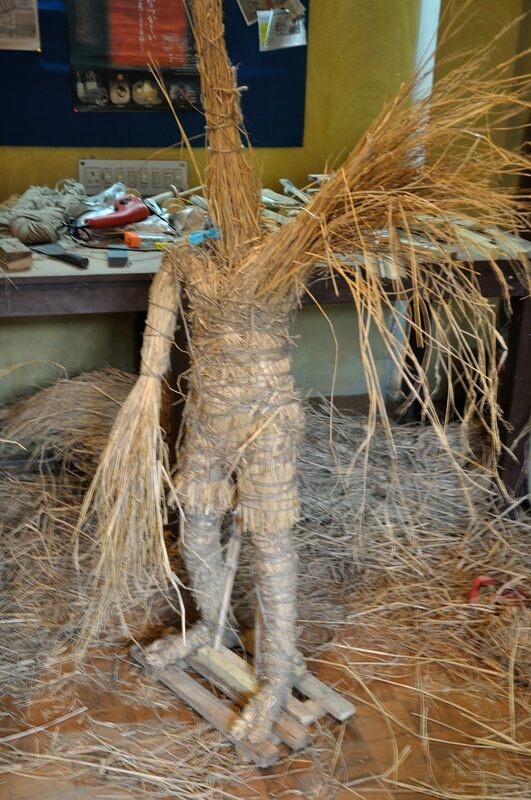 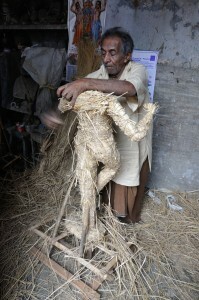 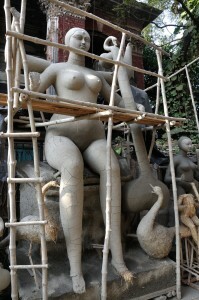 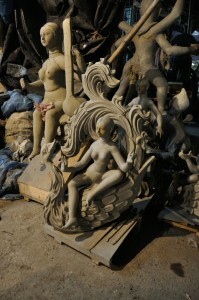 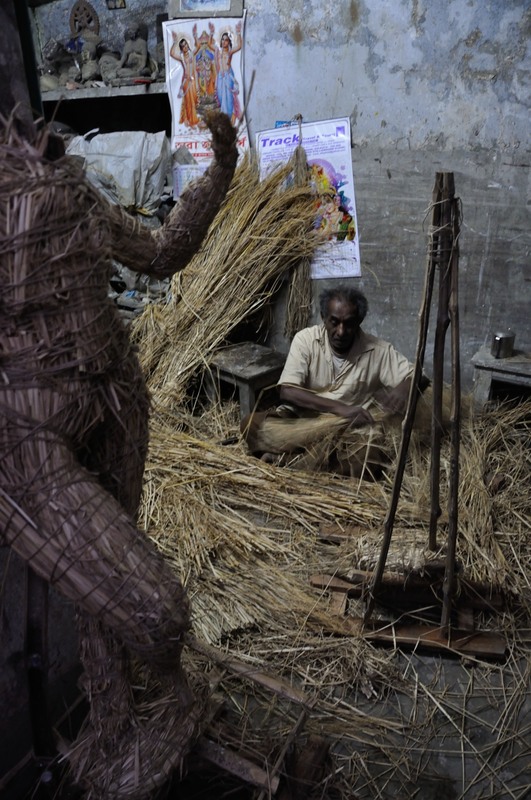 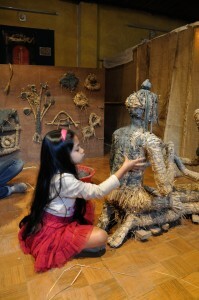 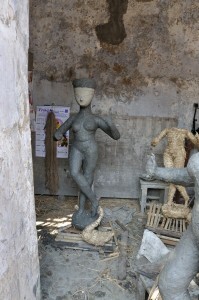 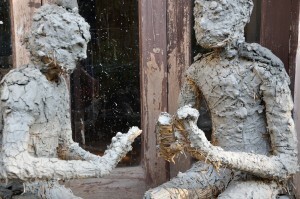 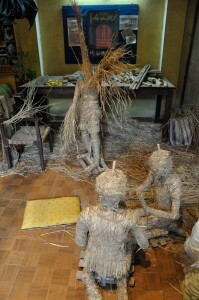 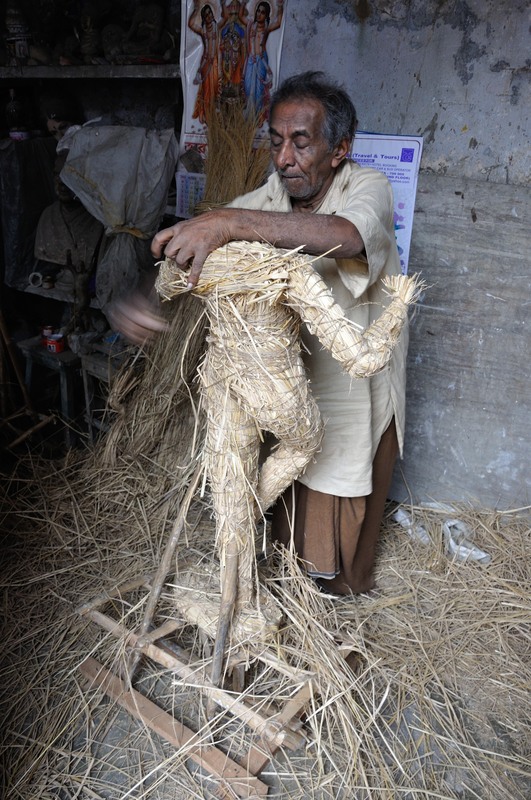 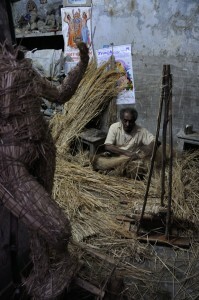 Straw Jagadhatri images-in-process at nighttime, Kumartuli. 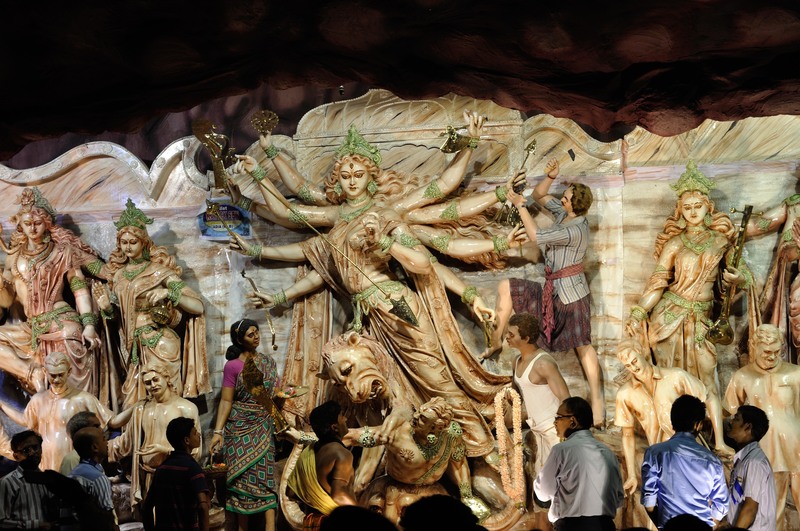 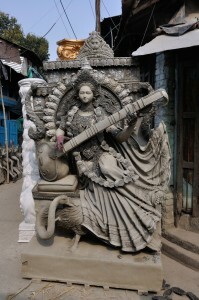 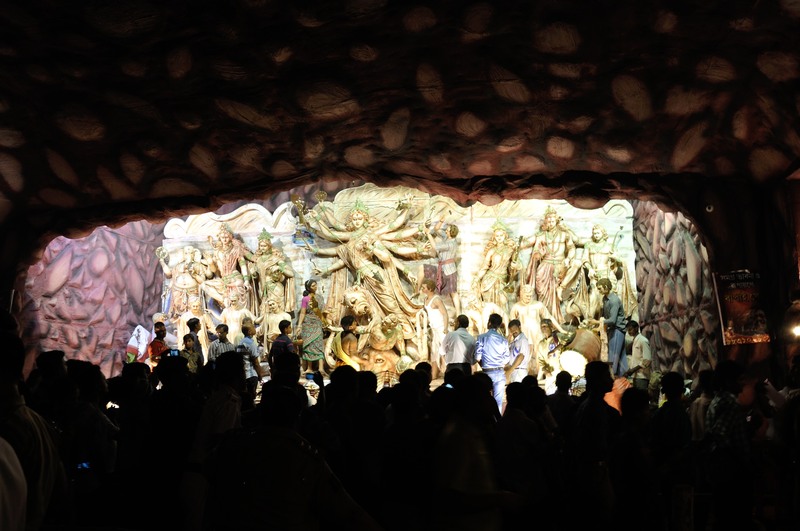 Traditionally, Durga Puja ends with the immersion of the pandal images into a stream or river. 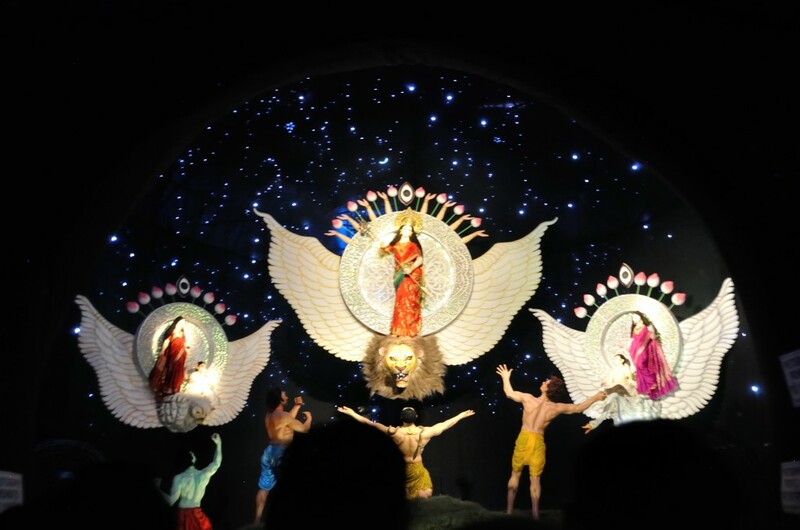 Once again, good has triumphed over evil, and Ma Durga and her children return to Mount Kailash and Durga’s consort, Lord Shiva. 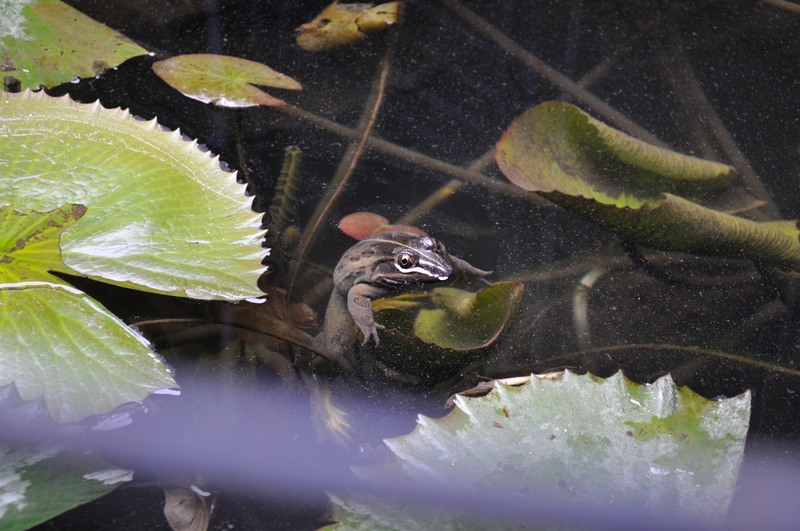 Thousands and thousands of images are submerged each year! 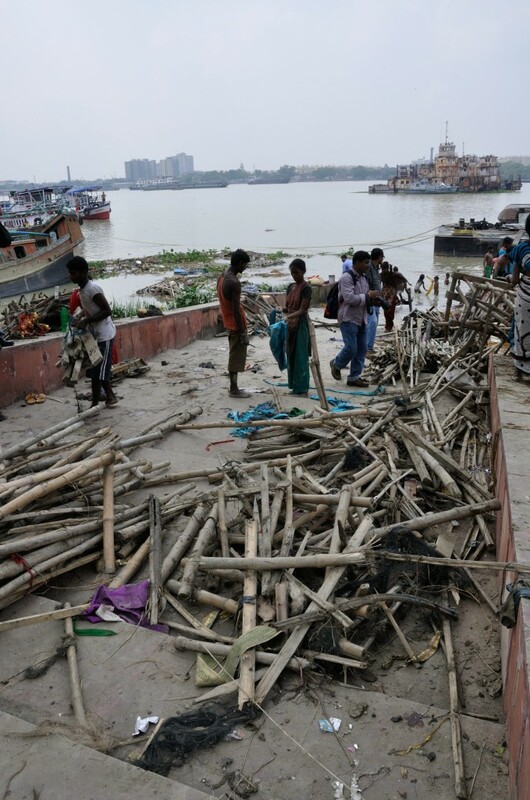 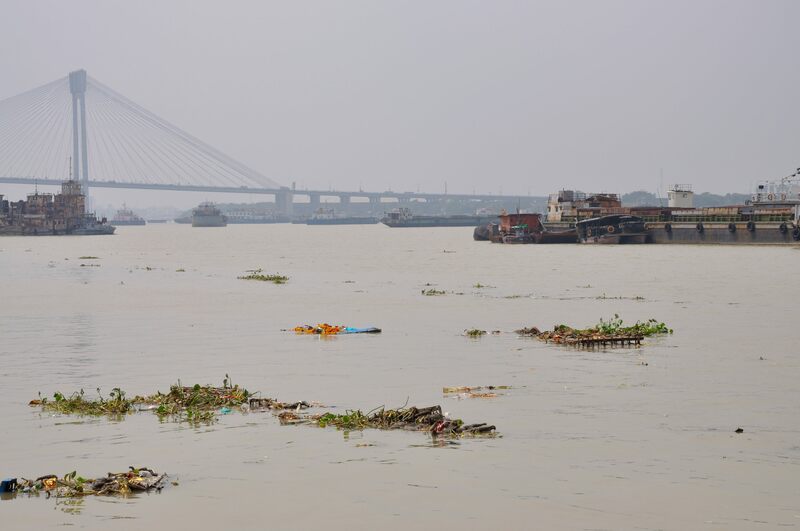 There are serious environmental concerns in Kolkata regarding the dumping of so much debris (not to mention chemicals from today’s use of acrylic paints, etc.) 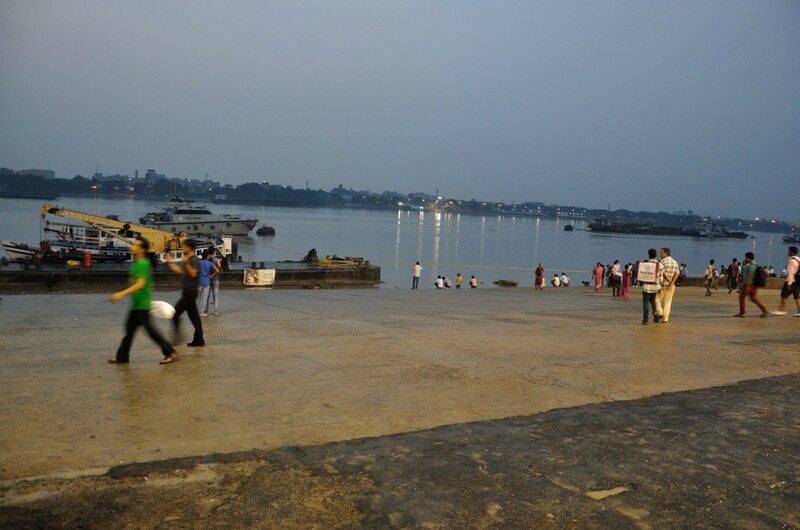 into the Hooghly. 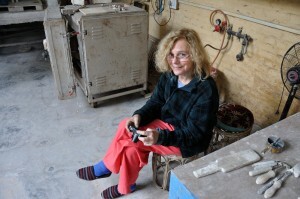 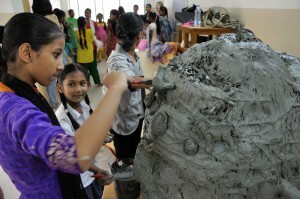 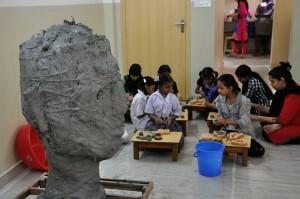 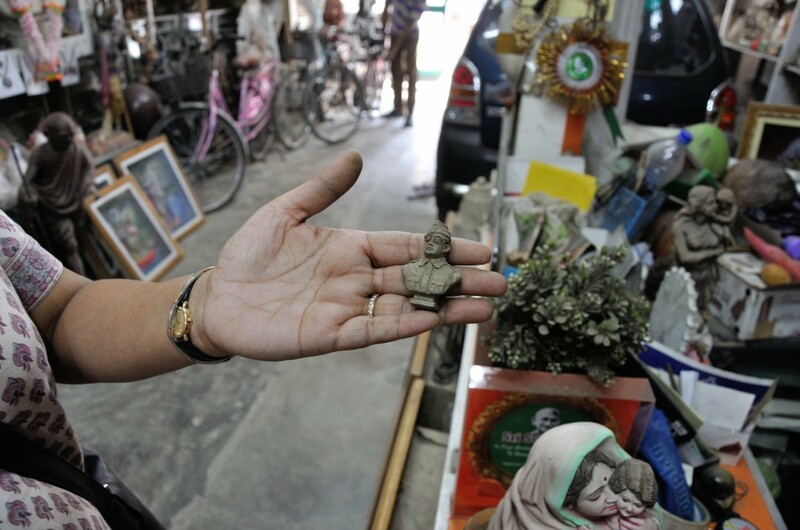 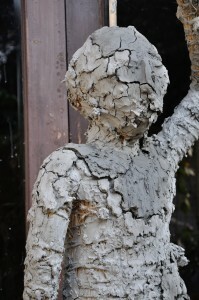 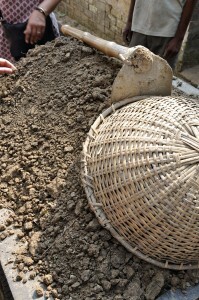 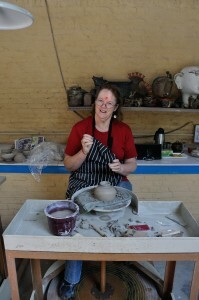 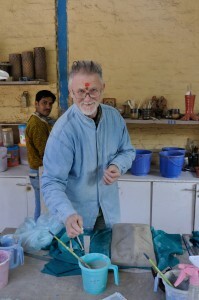 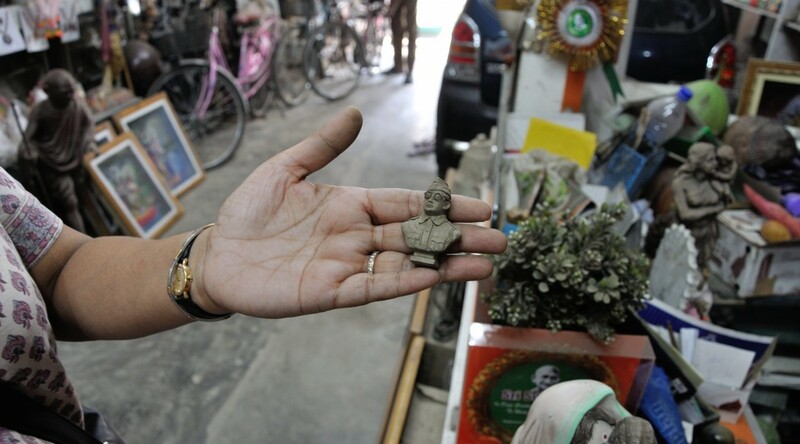 To alleviate these concerns, some communities or families now keep their clay images for several years before immersion. 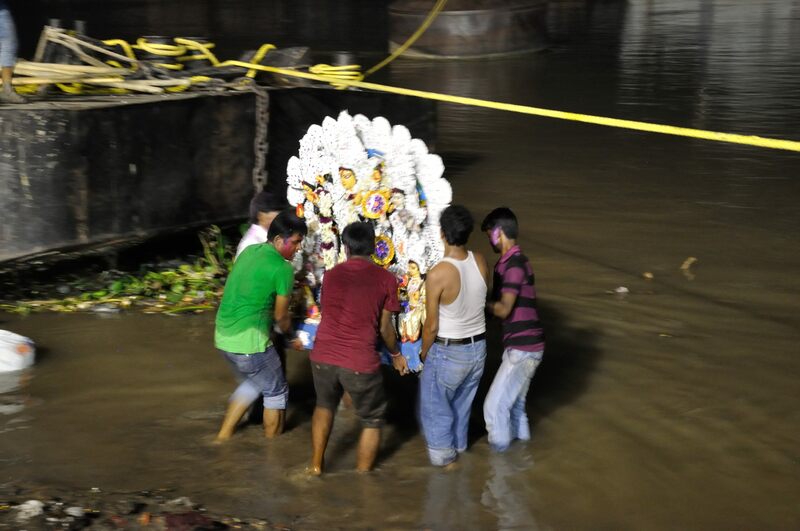 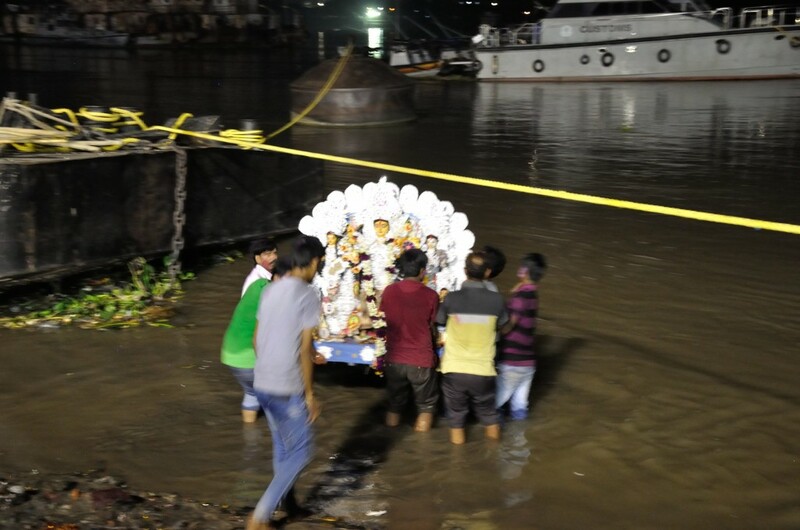 Others have developed their own symbolic immersion of the goddess and do not submerge the pandal at all. 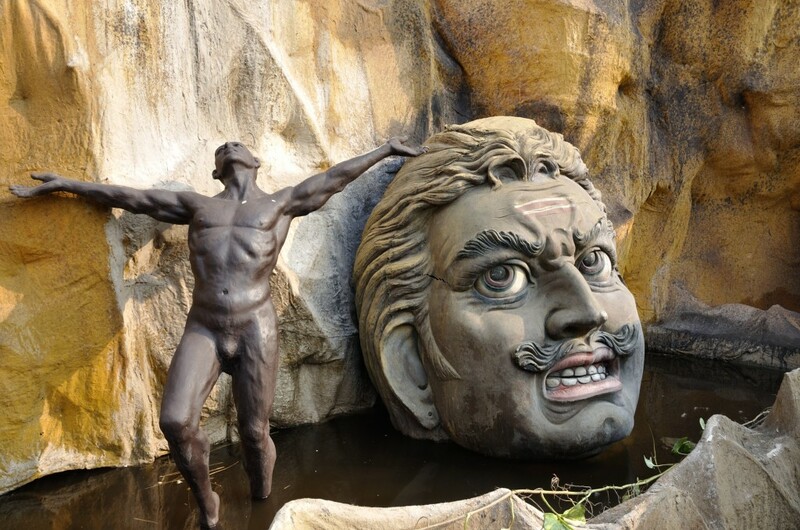 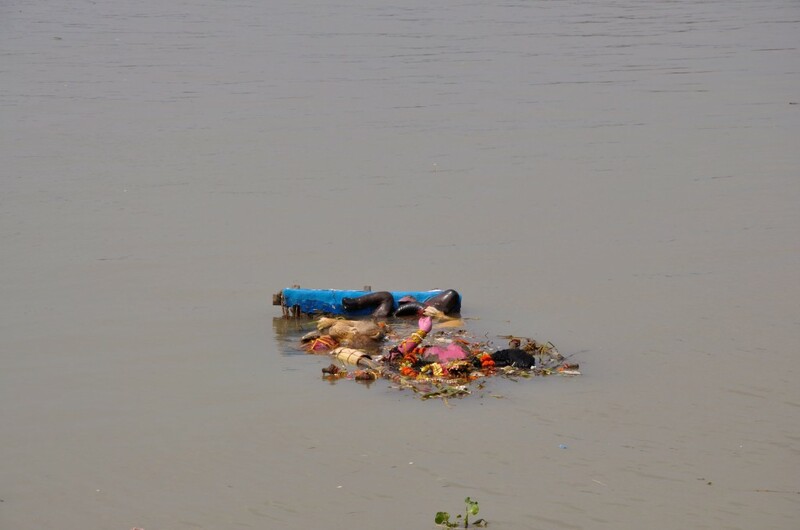 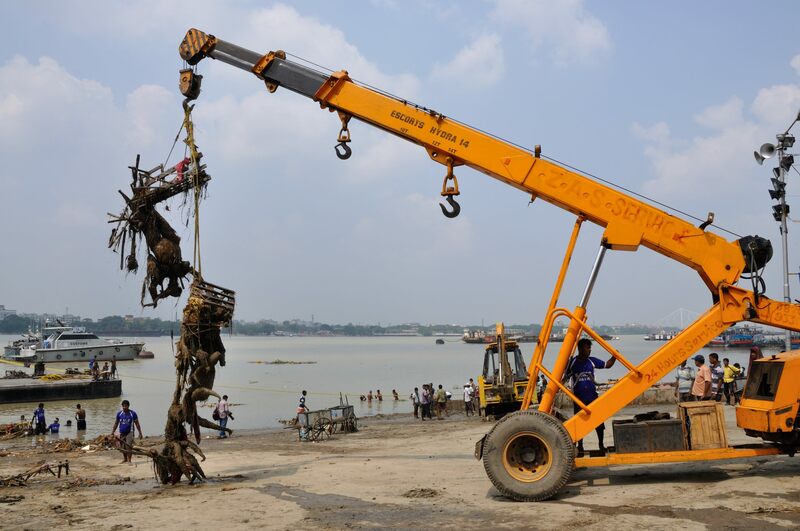 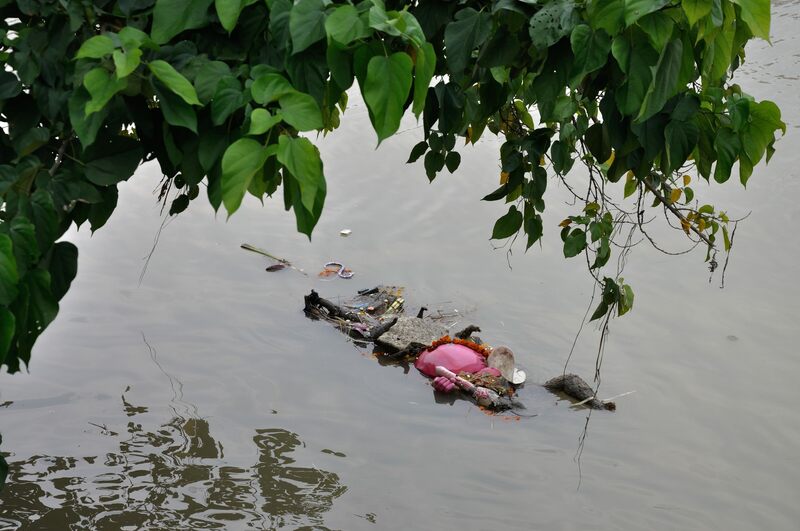 This year, a few media outlets reported that in some cities located along the banks of the Ganga river, all worshippers now submerge their images in man-made ponds instead of the river. 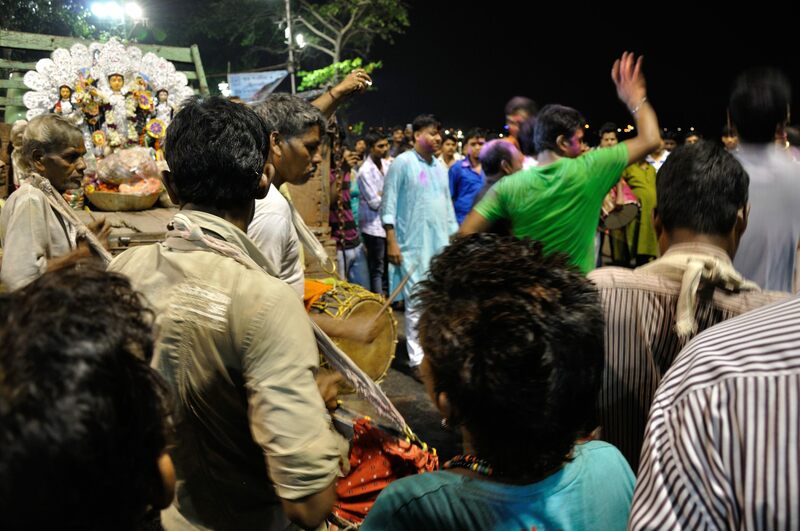 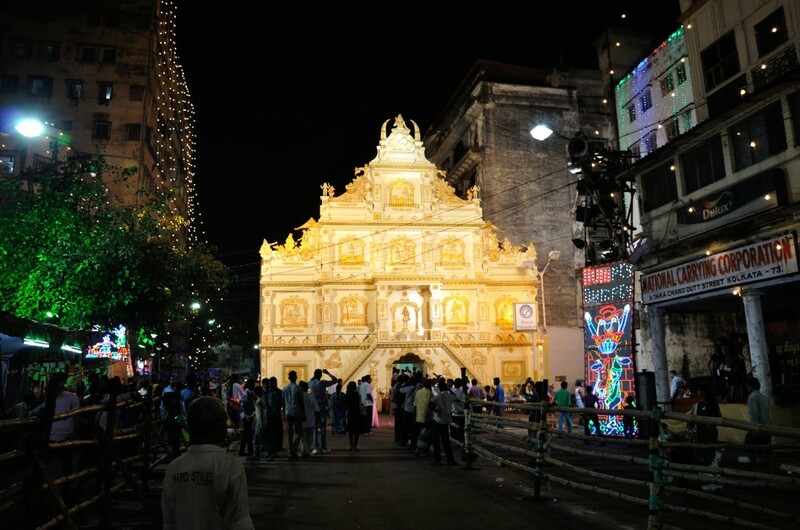 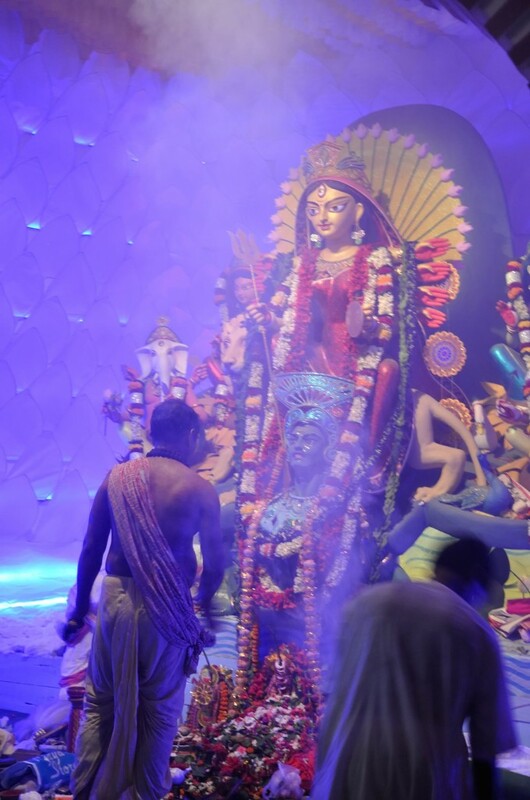 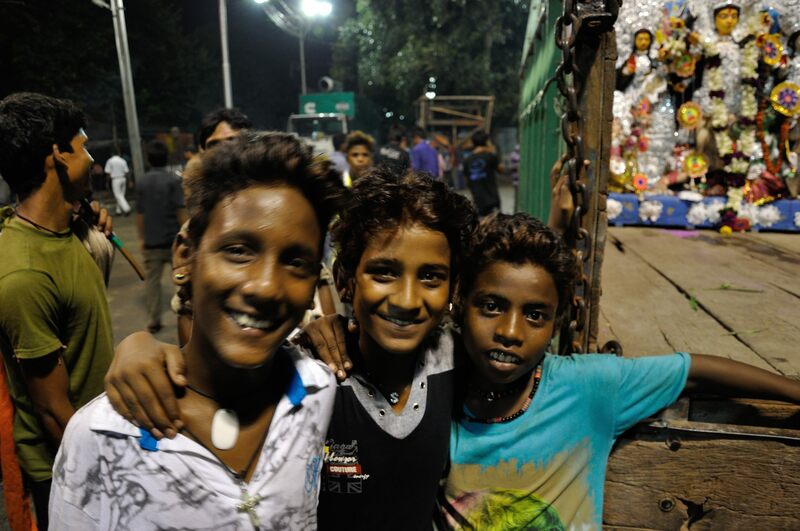 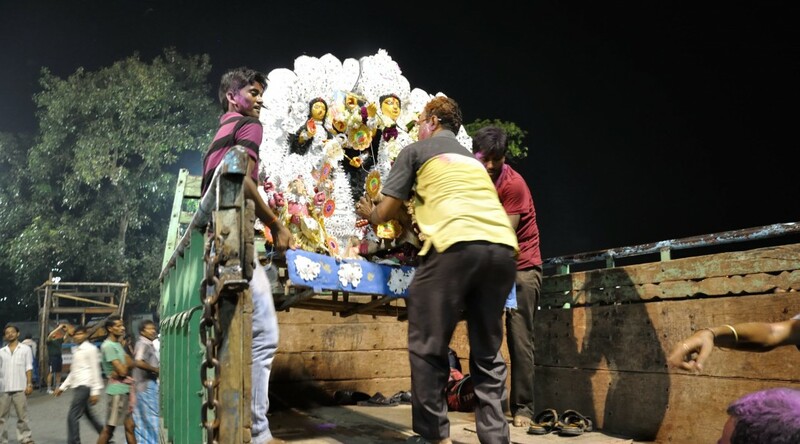 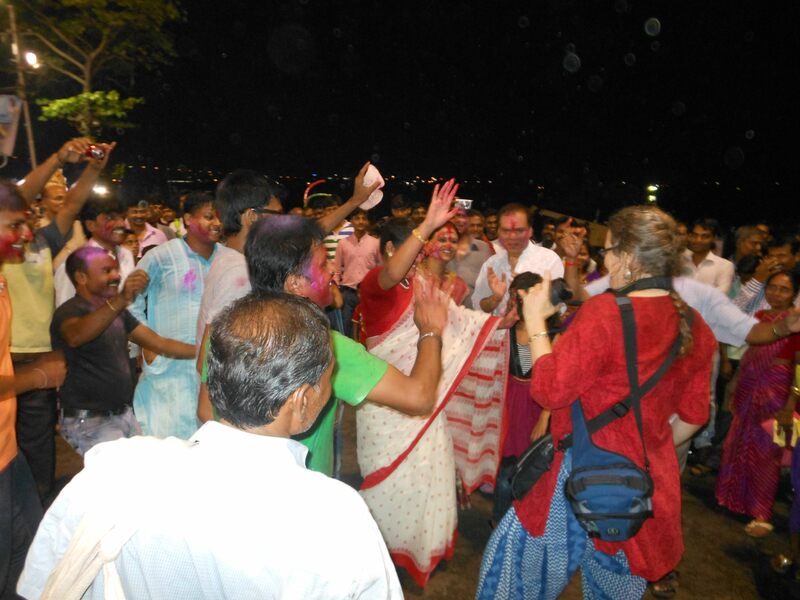 However, in Kolkata, many still chose to physically immerse their Durga pandal this year, and immersions began on October 3rd. The following morning there was a massive reclamation and recycling effort. 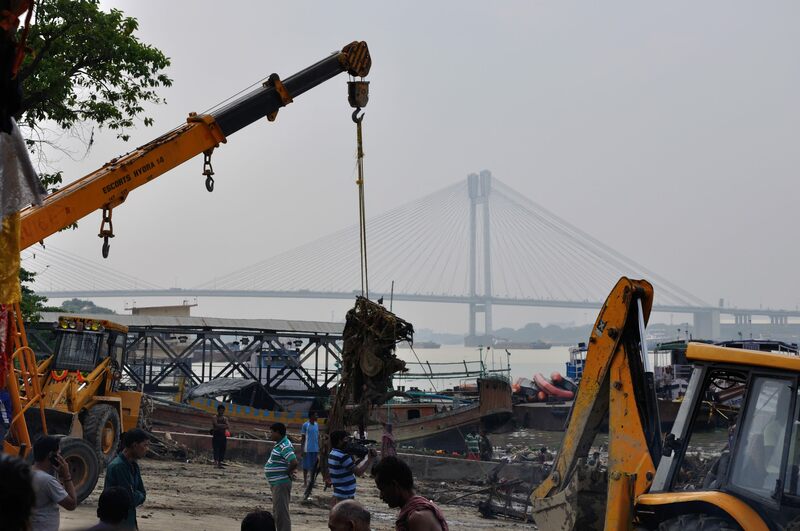 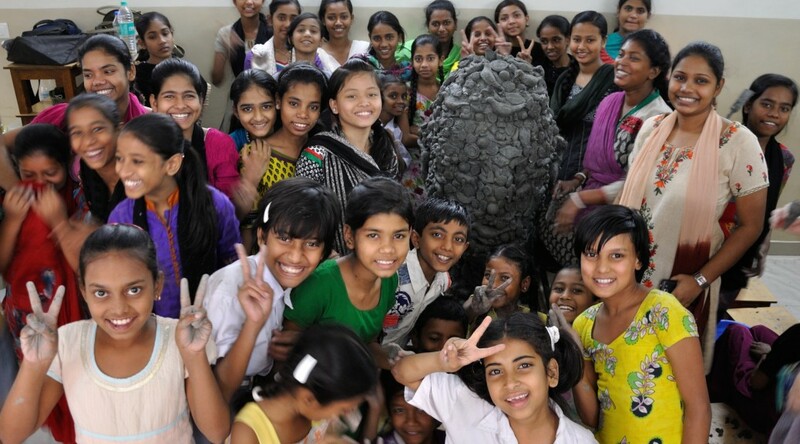 The images in this post will show you some of the efforts being made at an area next to the Hooghly river that is called Babughat. 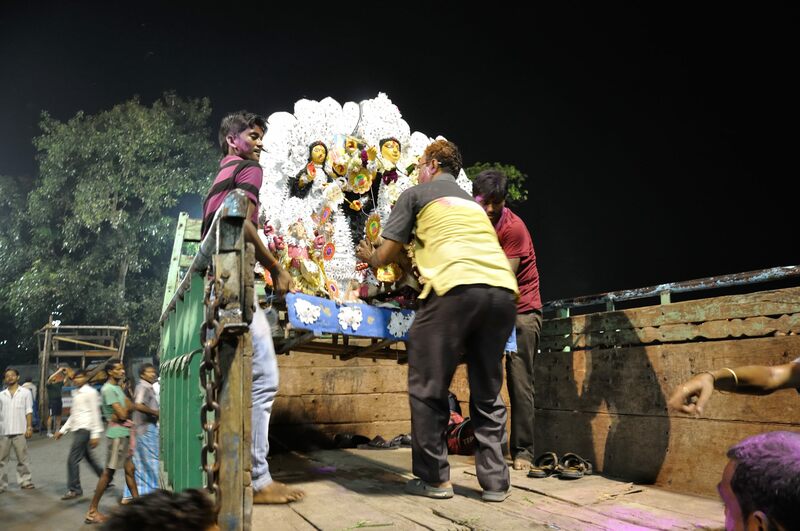 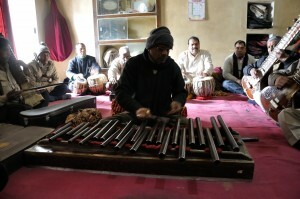 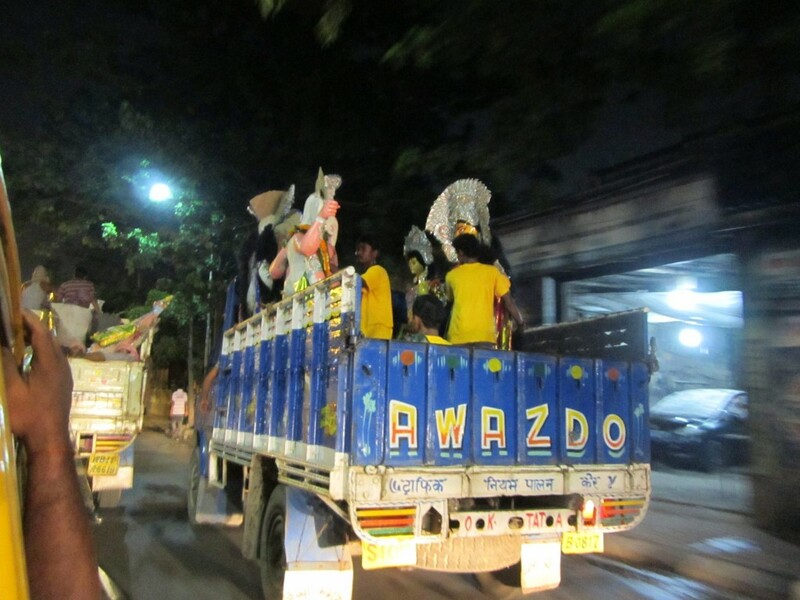 During the time set aside for immersions this year, convoys of trucks loaded with people and pandal images made their way to the river, while musically accompanying their journey with drums and chanting. 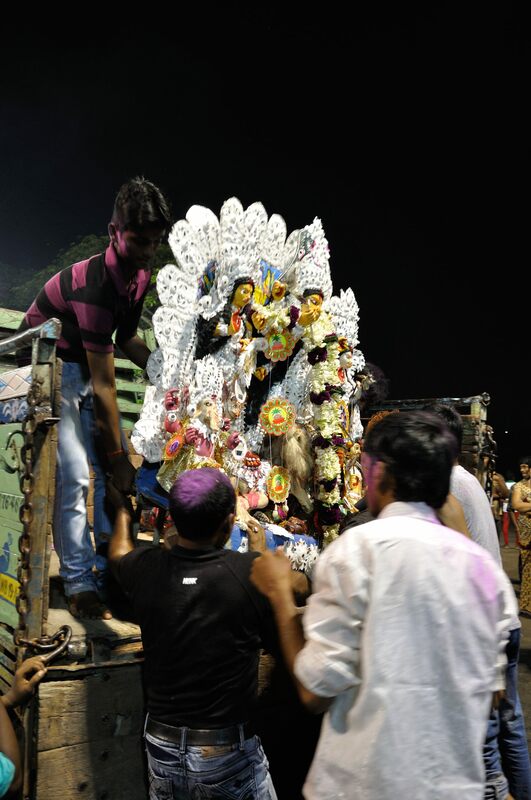 The group of people packed into the truck above all work for the same corporation, and they had brought the company’s puja pandal. 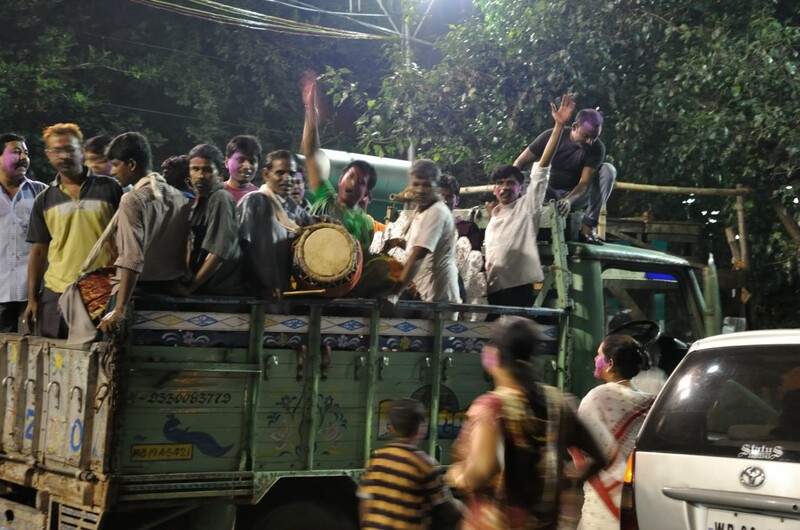 Lots of dancing and music to honor Durga and her children before lifting the images out of the truck. 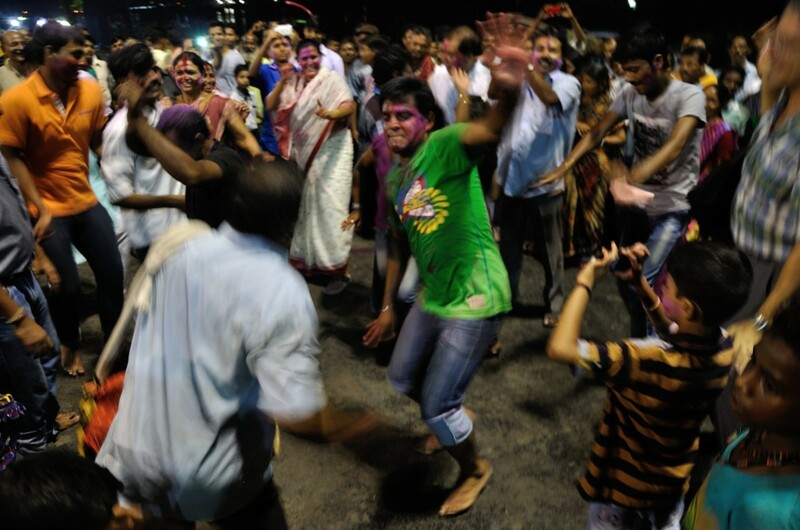 The company insisted that we join in the dance! 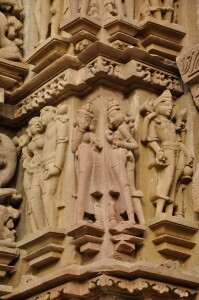 So here I am, happy to oblige, yet not exactly sure how to dance safely with my Nikon. 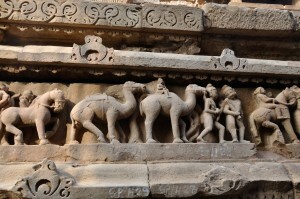 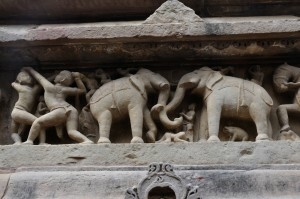 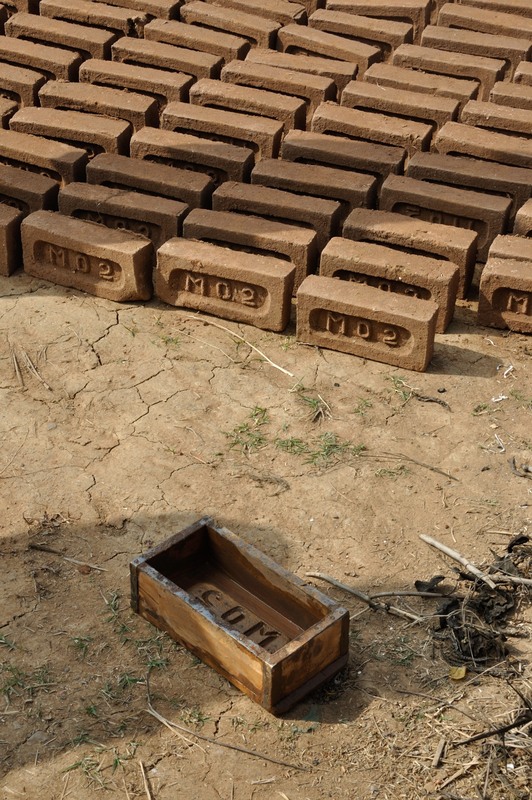 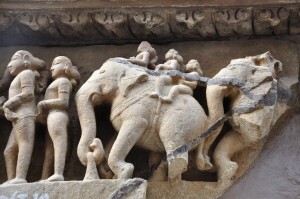 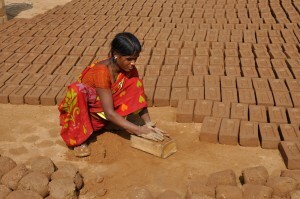 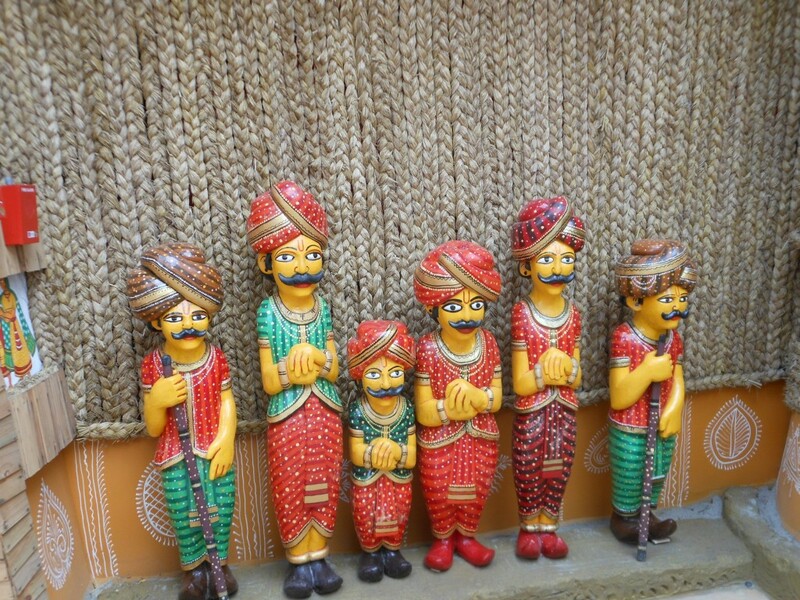 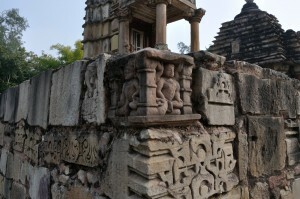 Notice the clay figures’ mouths – they had been fed some prasad, or religious offerings of food. 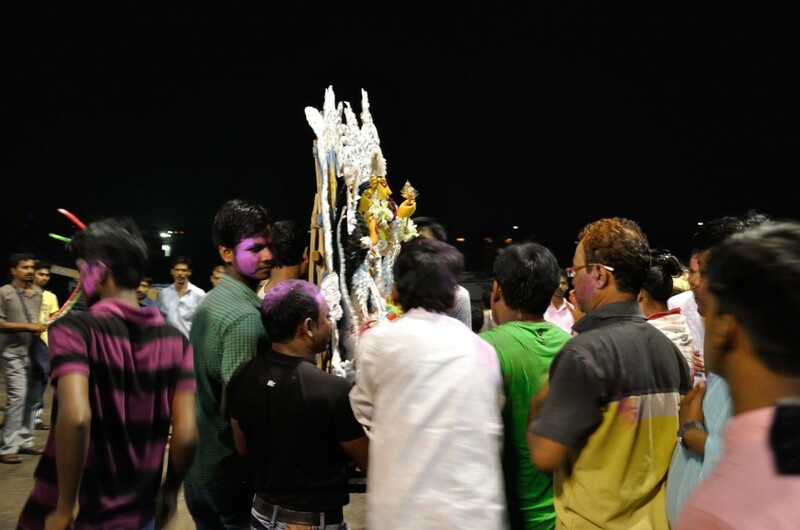 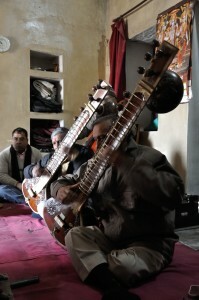 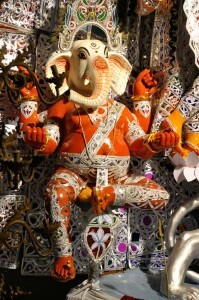 After being presented to the gods, prasad is then consumed by the worshippers. 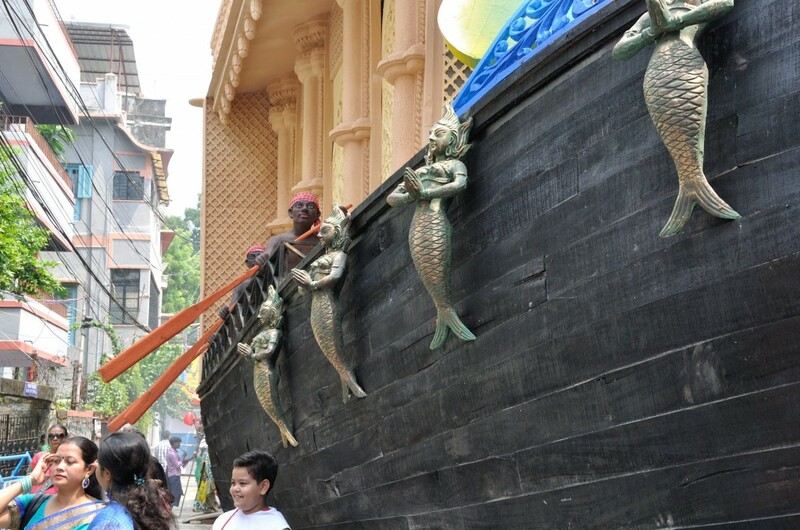 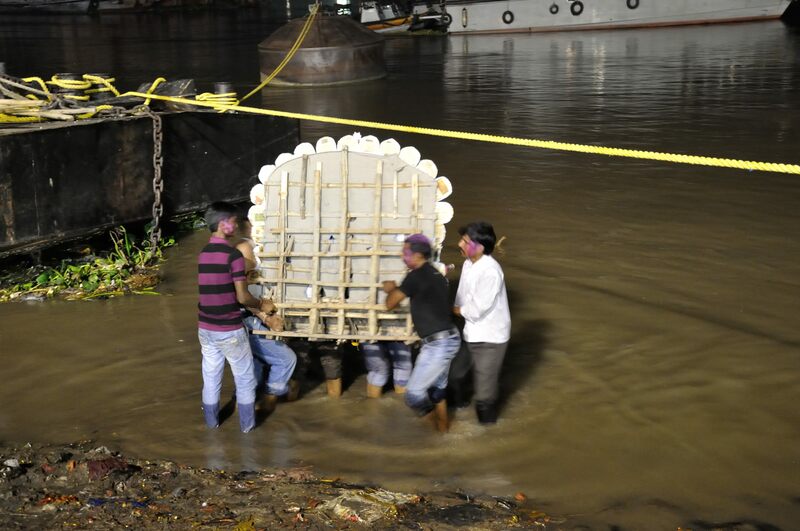 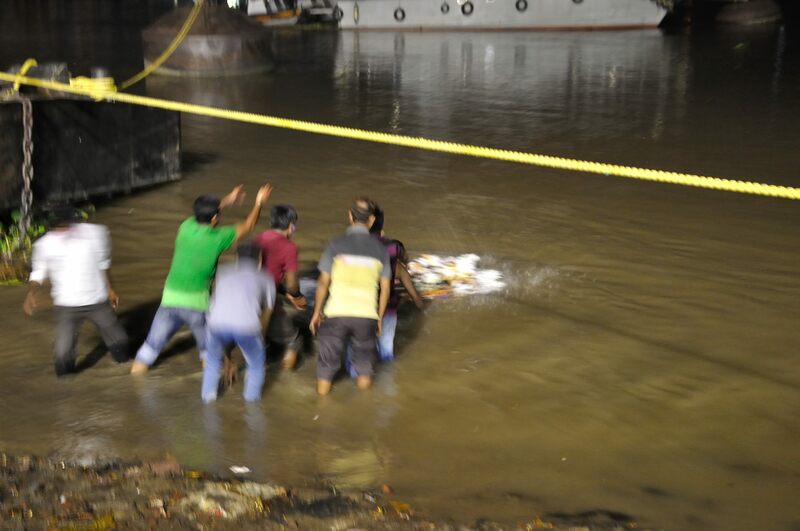 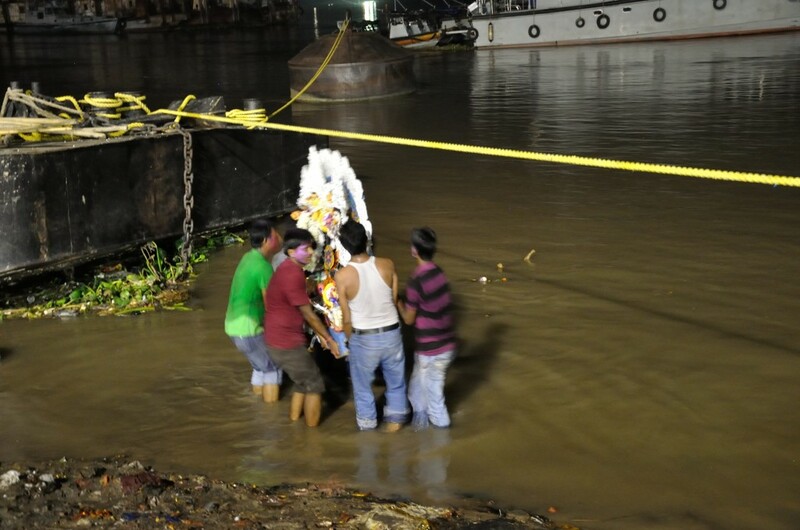 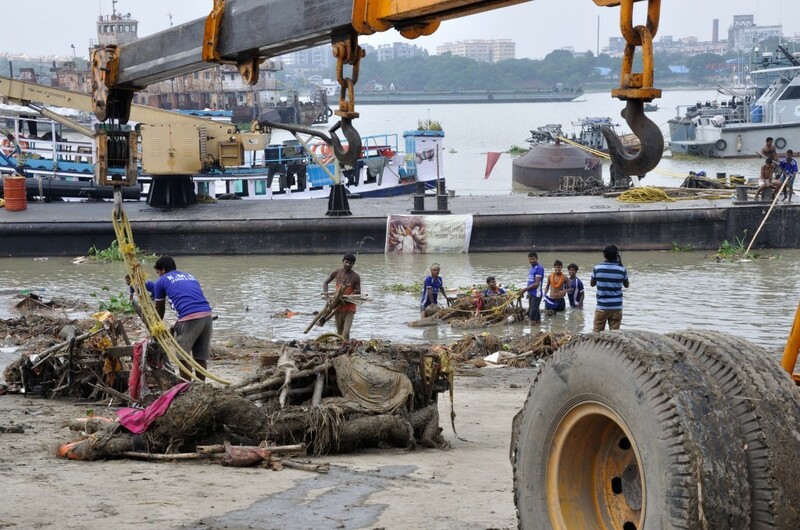 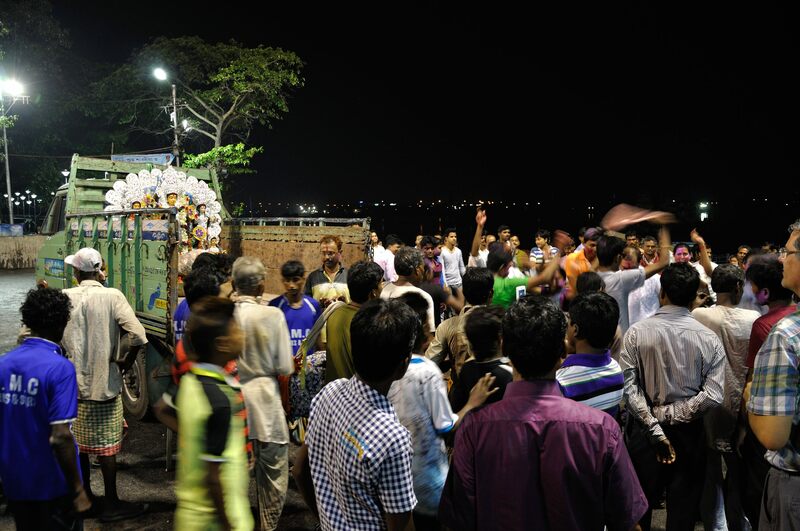 The pandal is spun around several times, before its bearers carry the pandal into the water. The pandal is once again turned around several times, before Durga and her children are laid down gently into the water. 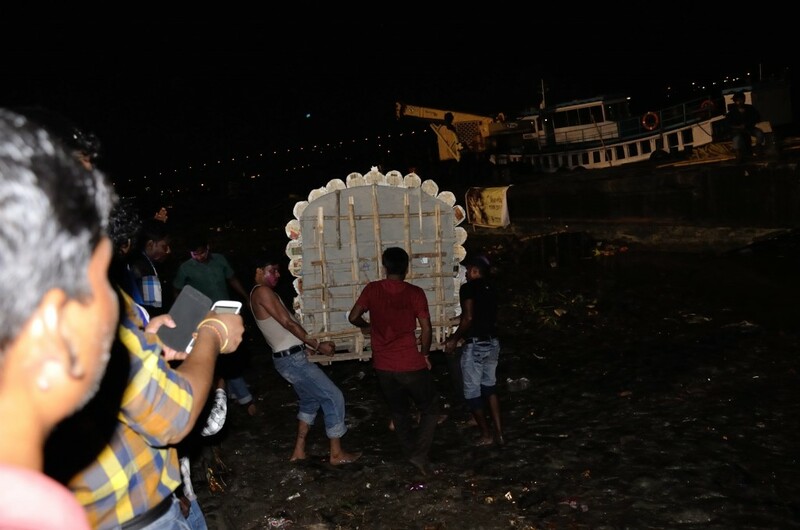 In the morning we can see pandal parts floating down the river. 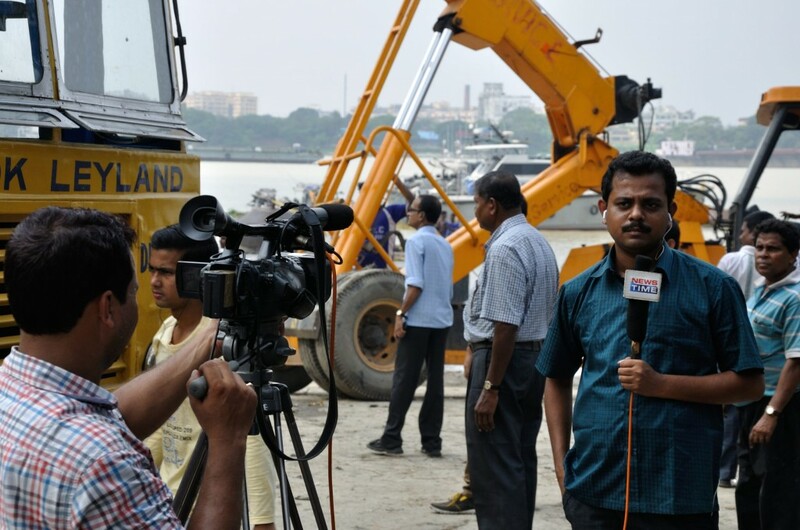 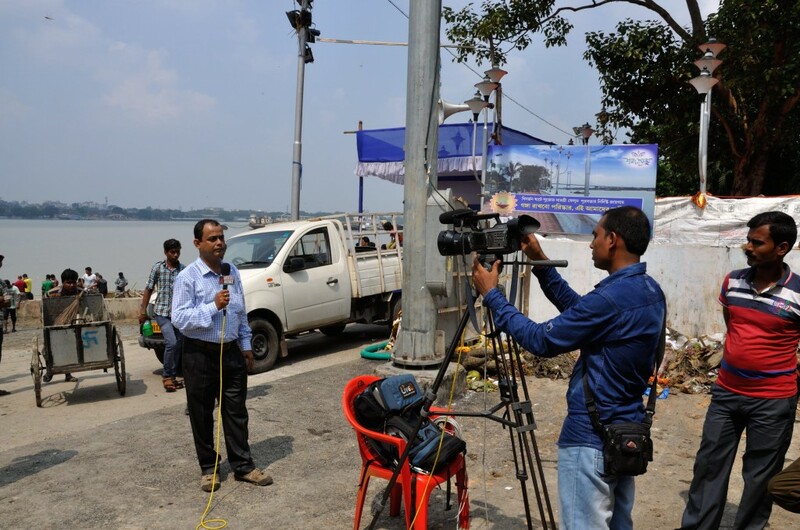 Television news teams on location at Babughat to report on the efforts to contain the pandal debris. 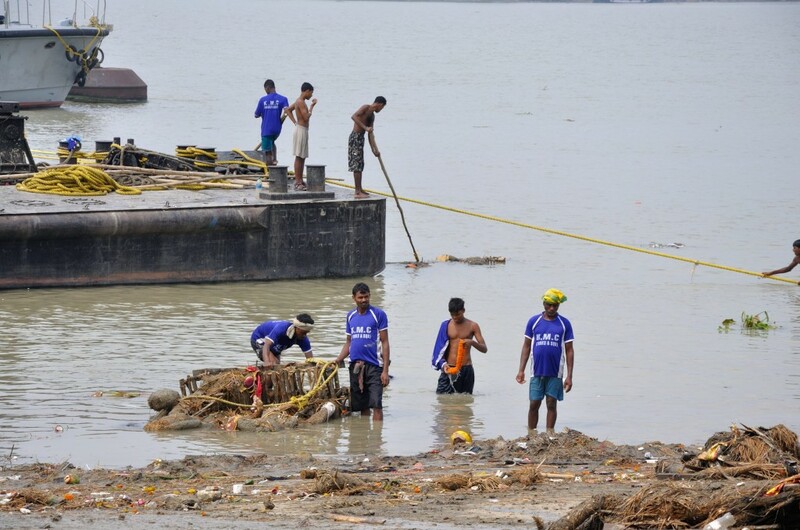 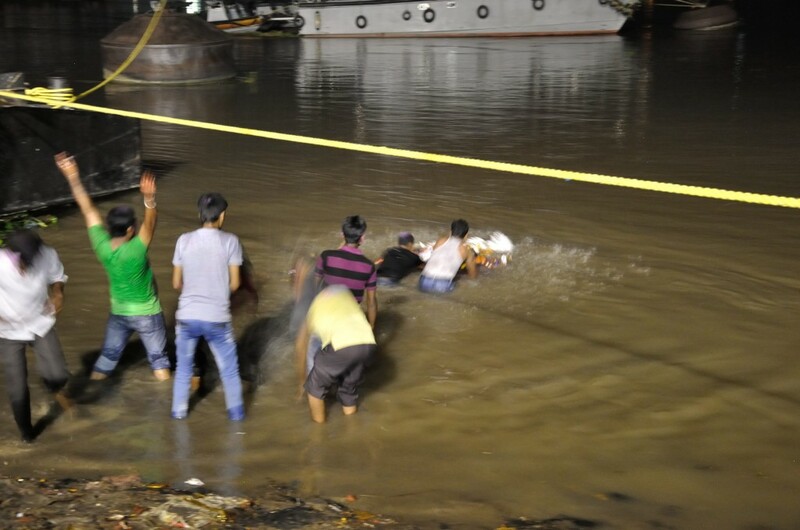 By 4pm, Babughat is completely free of debris and prepared for this evening’s immersions. 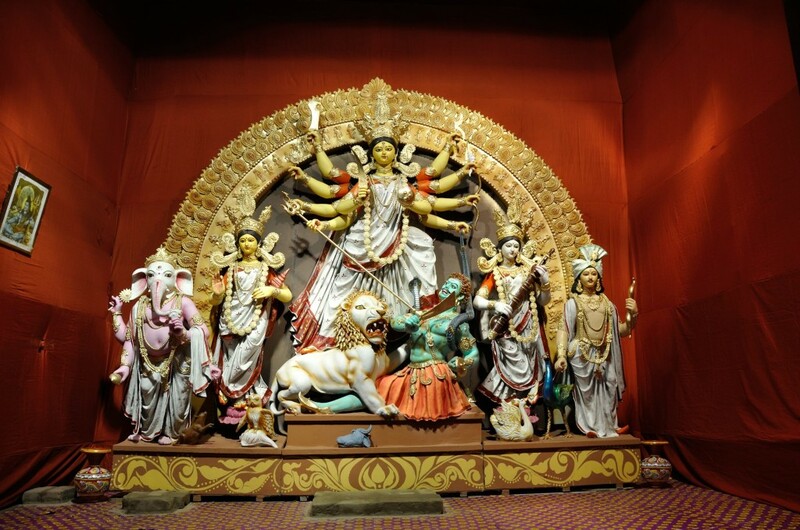 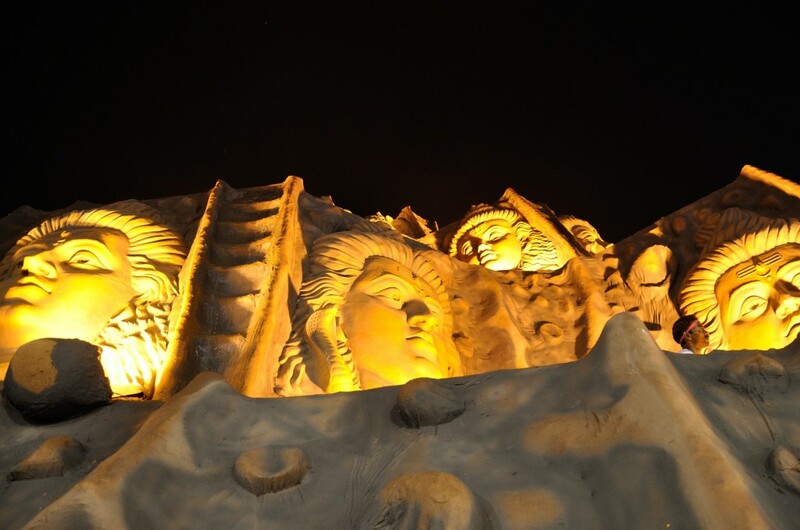 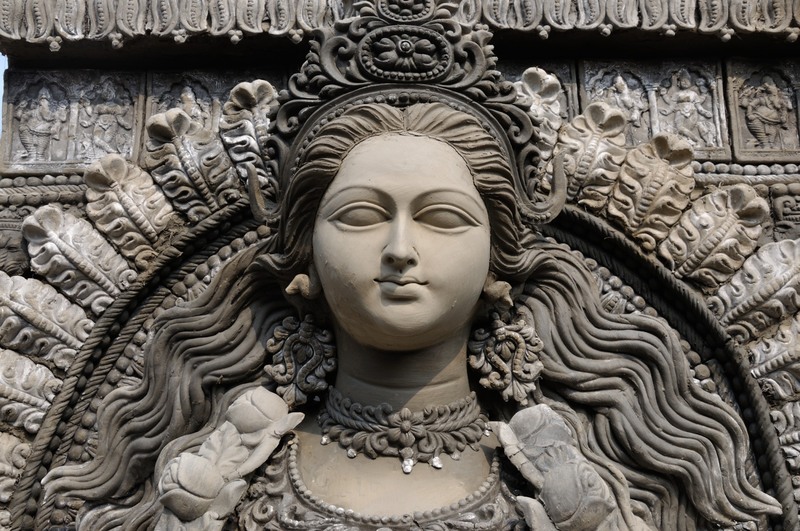 This post is a gallery of Durga Puja pandal image highlights from our explorations of Kolkata pandals throughout the following three days of the holiday. 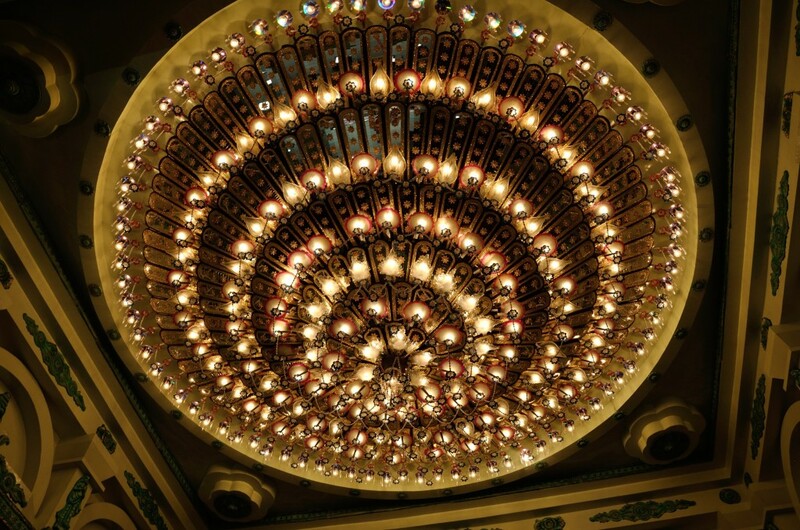 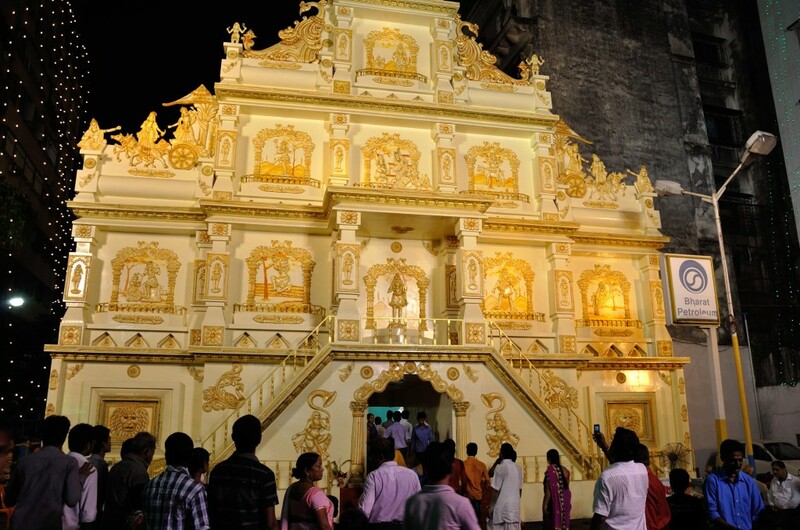 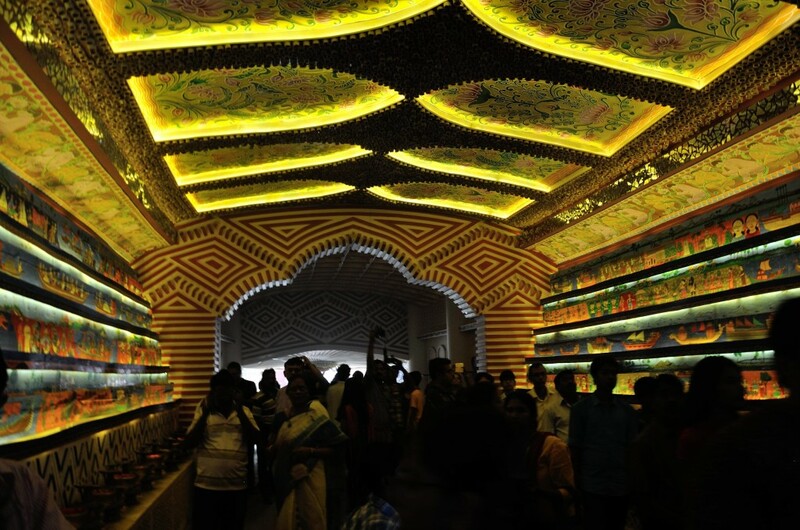 We admired some pandals for the beauty and creativity of their designs, and others for the mindbogglingly extensive craftsmanship that was required for their creation! 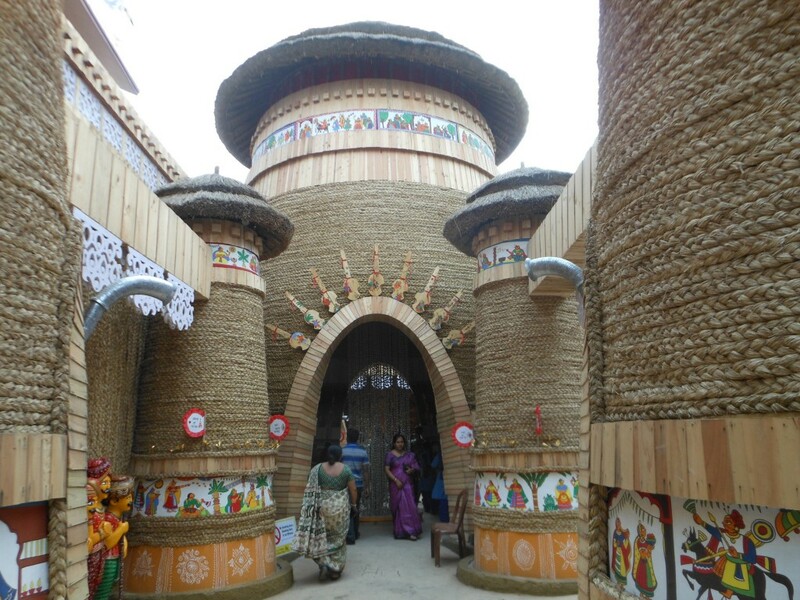 A South Kolkata pandal decorated entirely using braided jute. 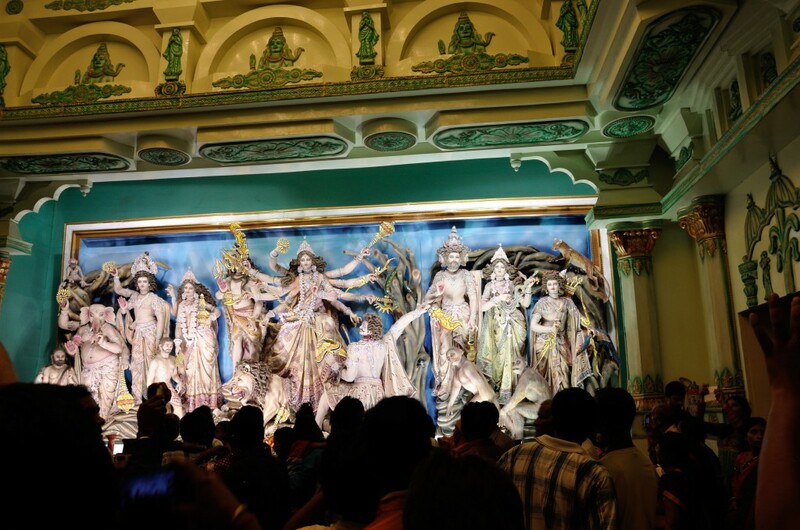 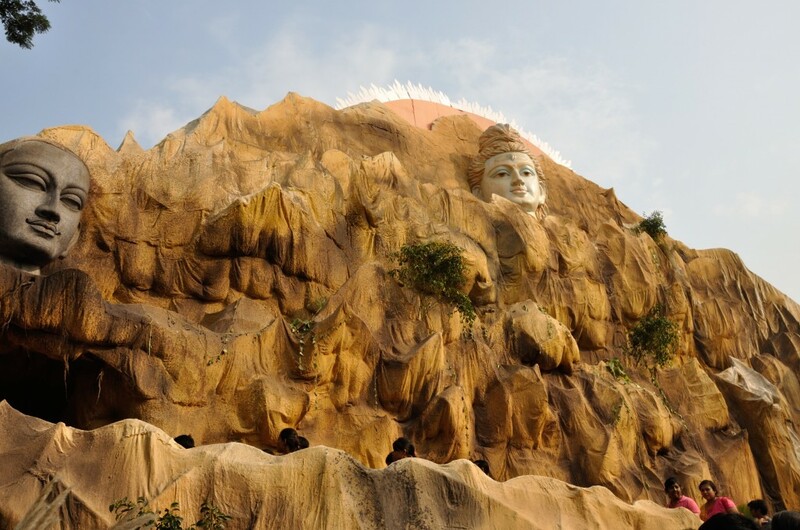 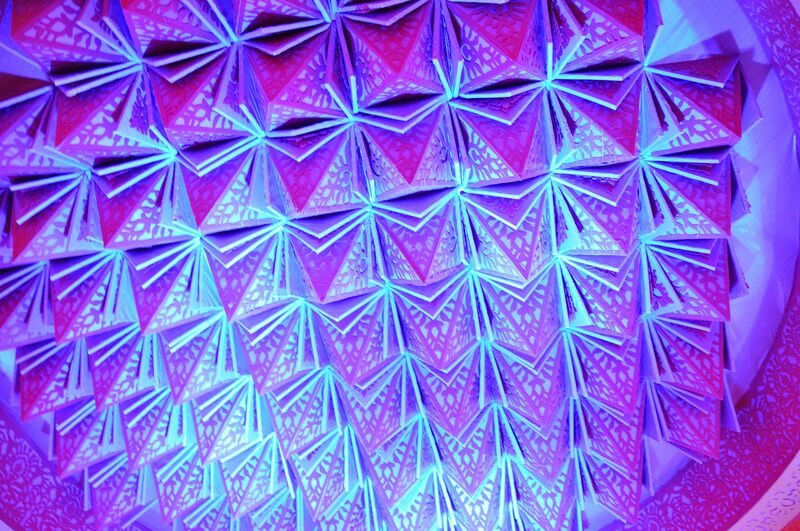 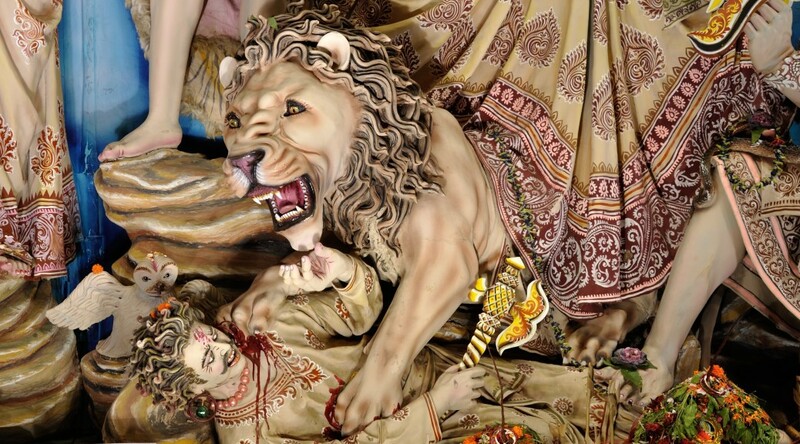 With images that are highly realistic — this pandal is also non-traditional in the sense that it includes many other figures besides the traditional scene of Durga, Ganesh, Lakshmi, Saraswati, Kartik, Mahisasura, and the Lion. 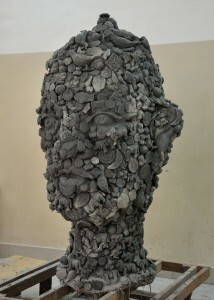 Gods such as Brahma are also present, in addition to several human and animal onlookers. 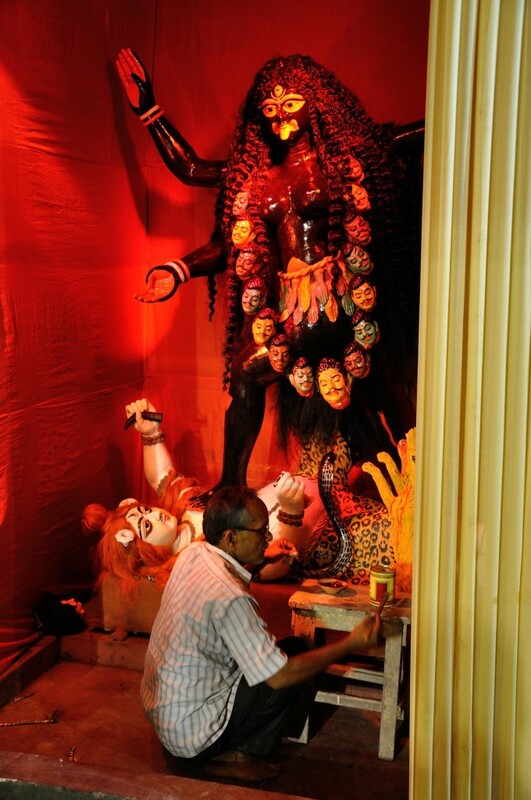 A priest performs the traditional rites at the foot of this pandal’s Durga image. 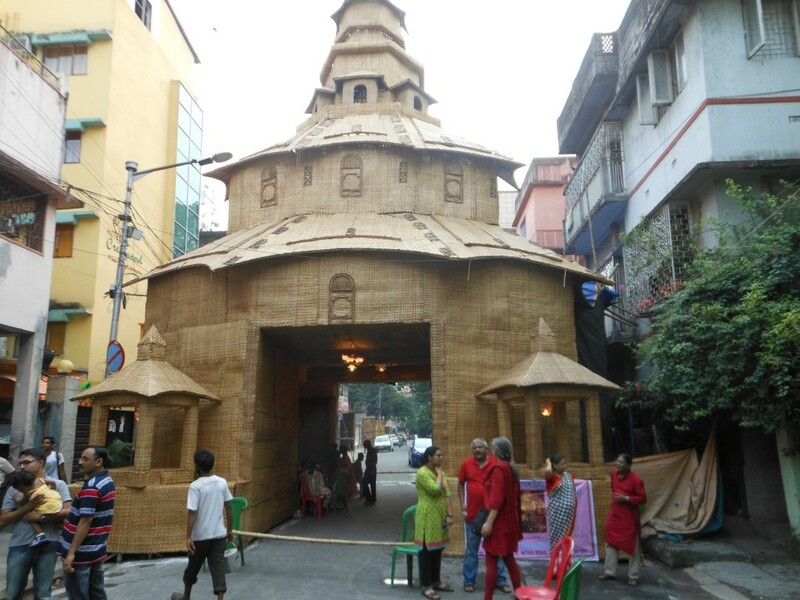 Waiting in line to go inside this monumental pandal near College Street, the famous central Kolkata street of booksellers. 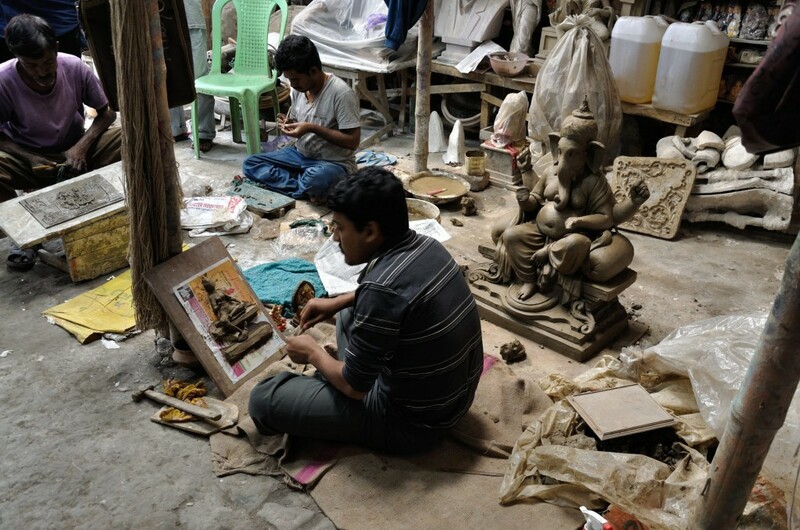 The figures of this pandal also include a few image-makers, who are now forever putting the final touches on the pandal. 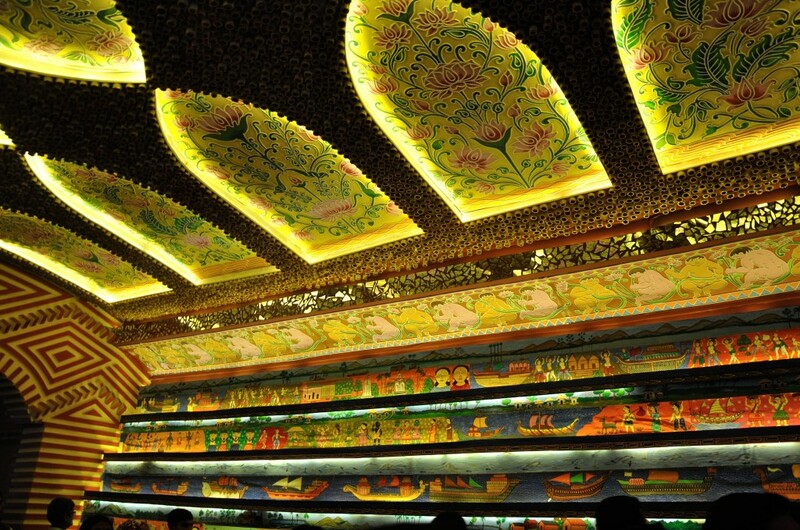 And out the exit we go! 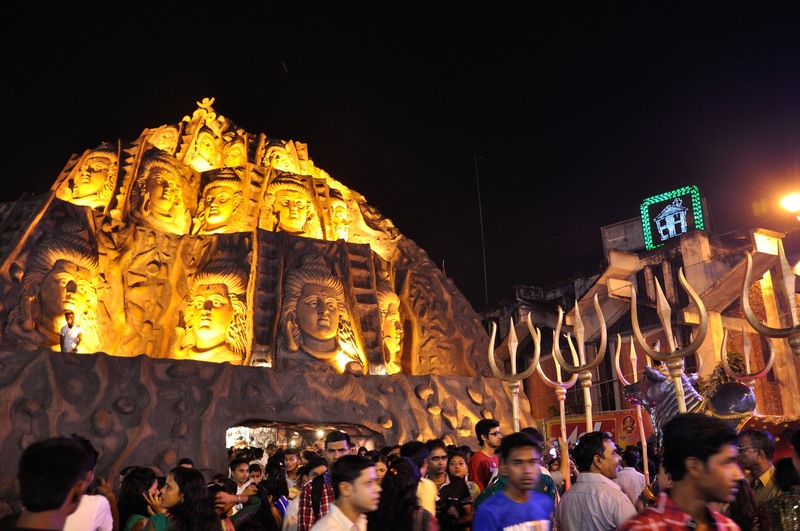 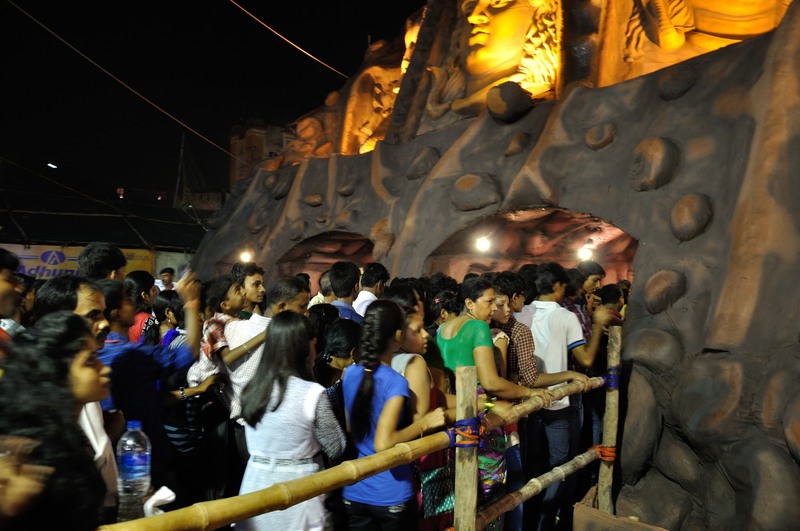 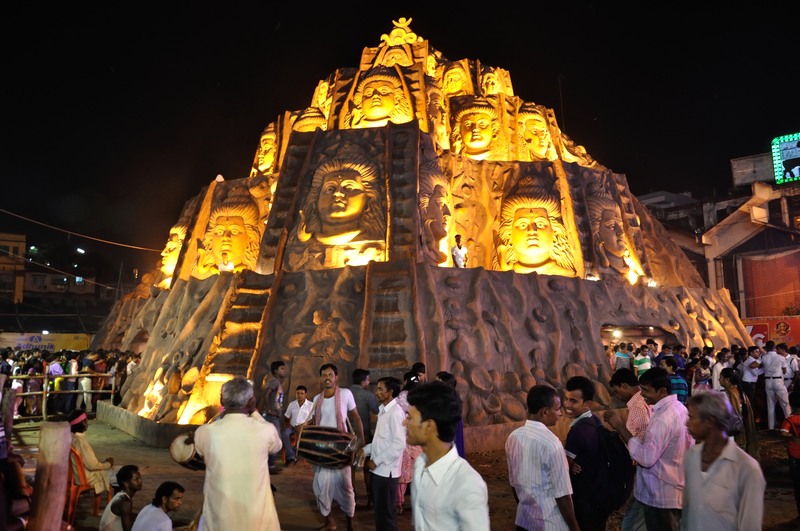 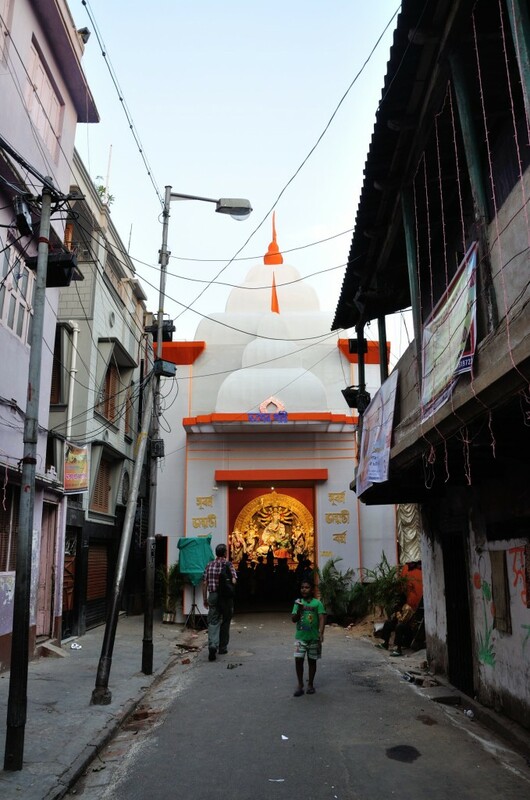 In the larger pandals, it is often very difficult to stay for a long time and enjoy the Durga pandal images, due to the numbers of people visiting, and the often very tight crowd controls. 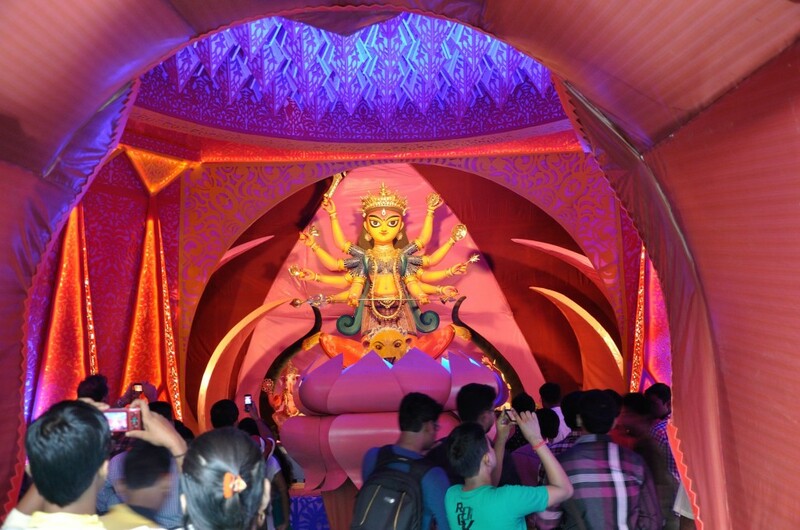 In a couple of the larger pandals that we visited, we spent over an hour reaching the inside of the pandal, only to have about ten seconds to look, before traffic volunteers directed us to the exit. 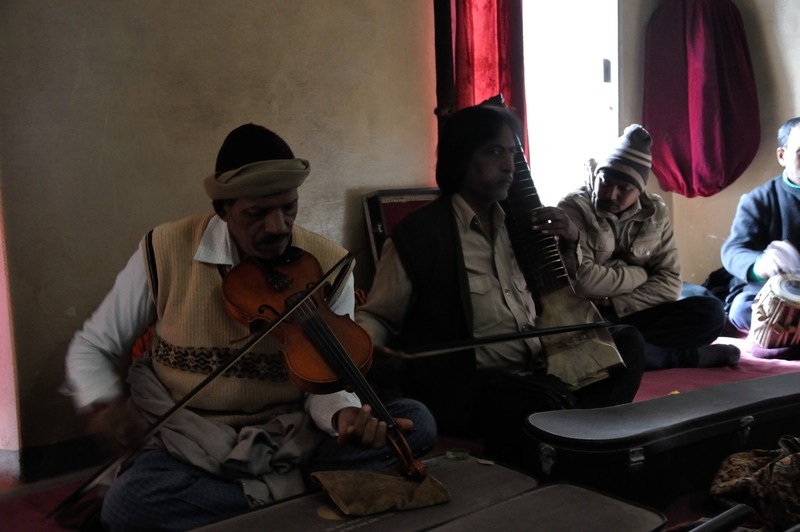 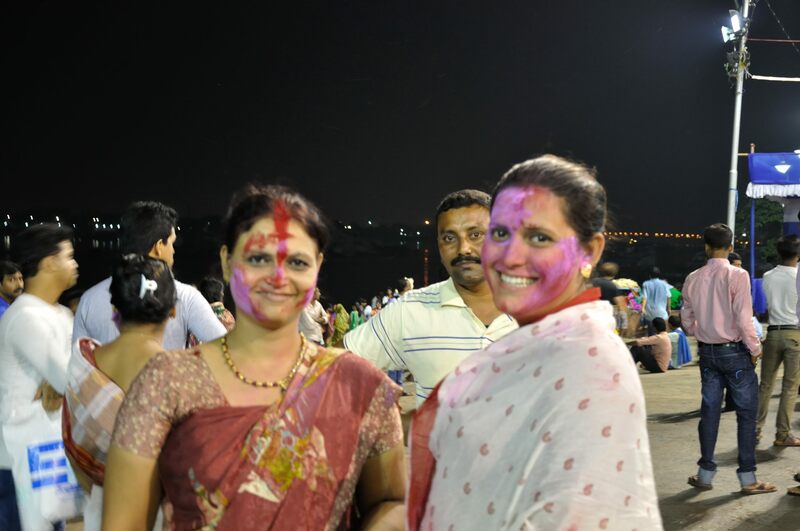 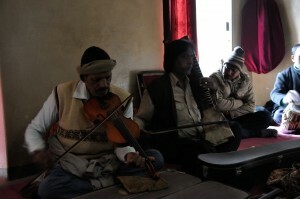 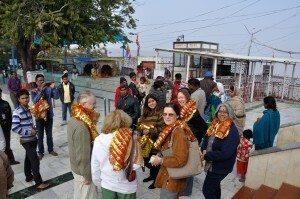 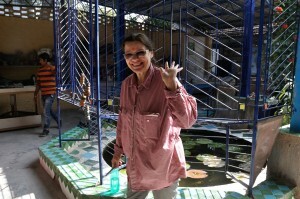 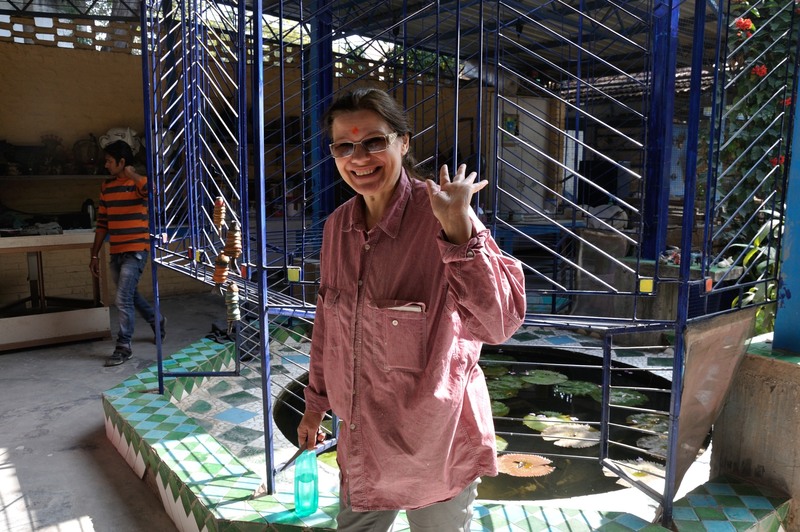 However, in many of the community pandals, we were welcome to sit and spend as much time as we wanted. 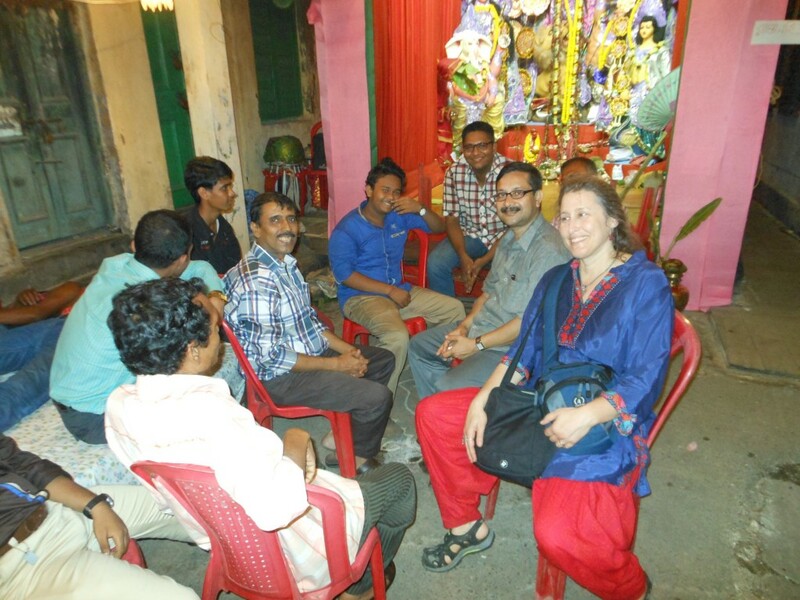 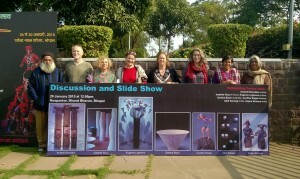 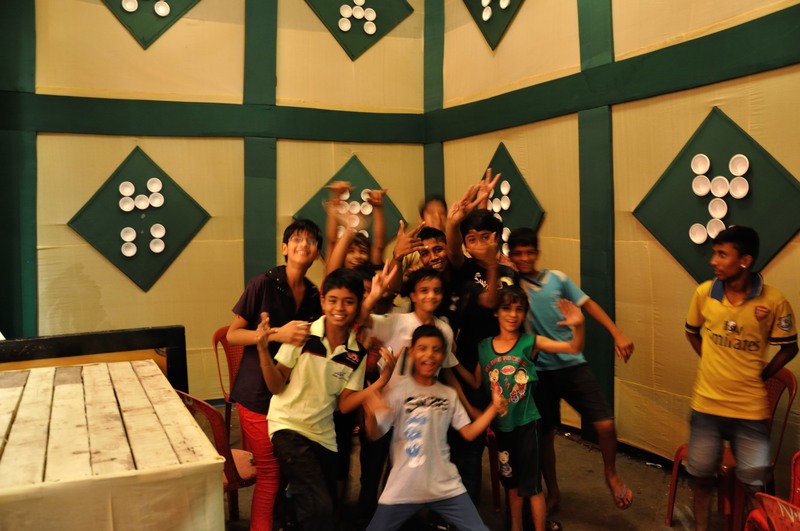 Enjoying the camaraderie and hospitality of a community pandal. 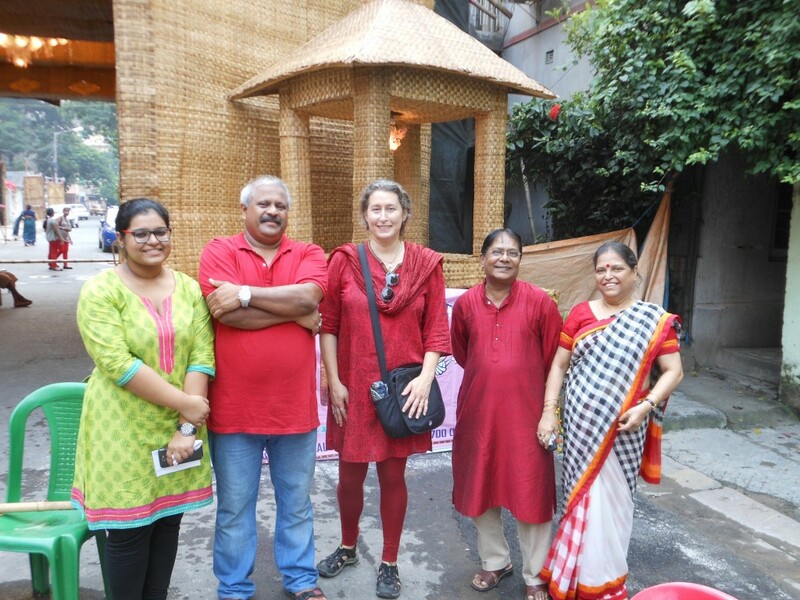 Stan and I enjoyed a delicious lunch and great conversation with the community members sponsoring this pandal near Park Circus. 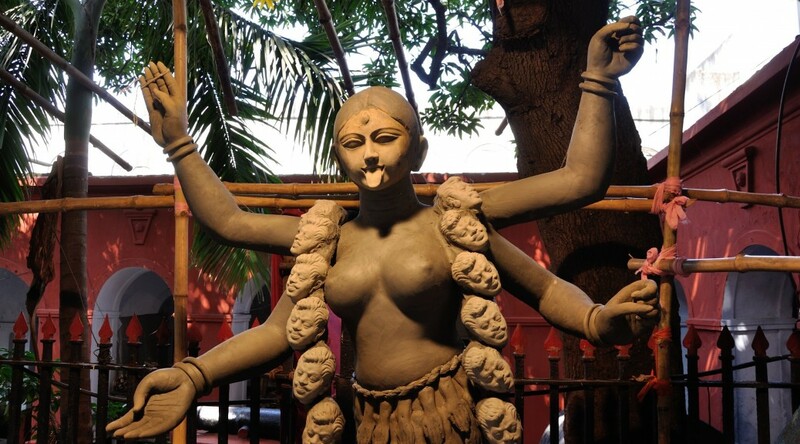 Durga pandal of a central Kolkata home, where Stan and I were invited in to share a bounty of homemade traditional sweets. 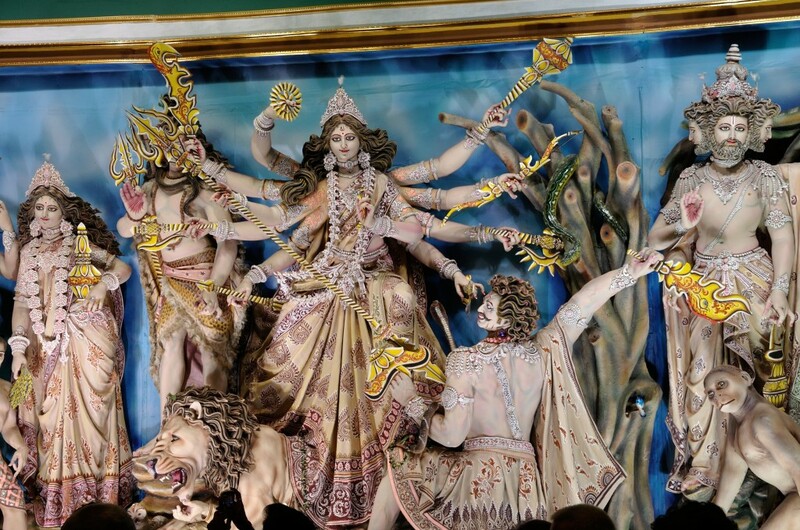 Soon the end of this holiday will come, and Durga will return home, after the pandals are physically and/or ritually immersed in flowing water. 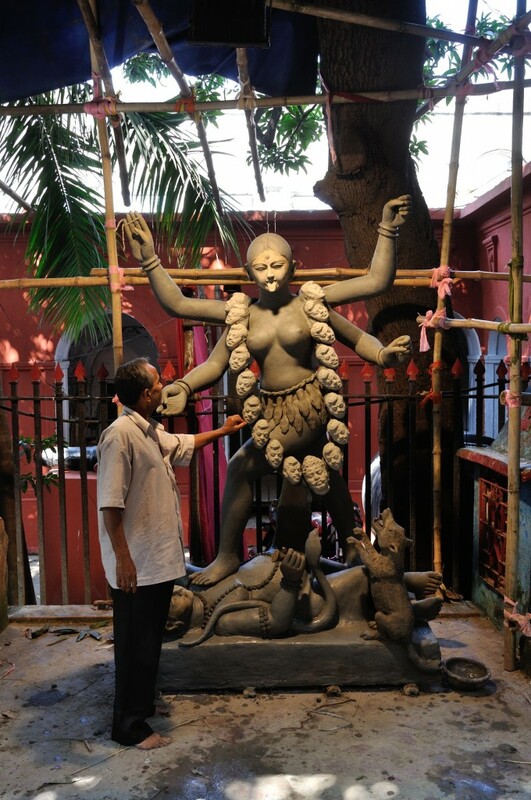 For today’s pandal-hopping, Stan and I decided to return to Kumartuli, particularly to view the final installation of Dilip-da’s Durga pandal at the Shovabazar Rajbari. 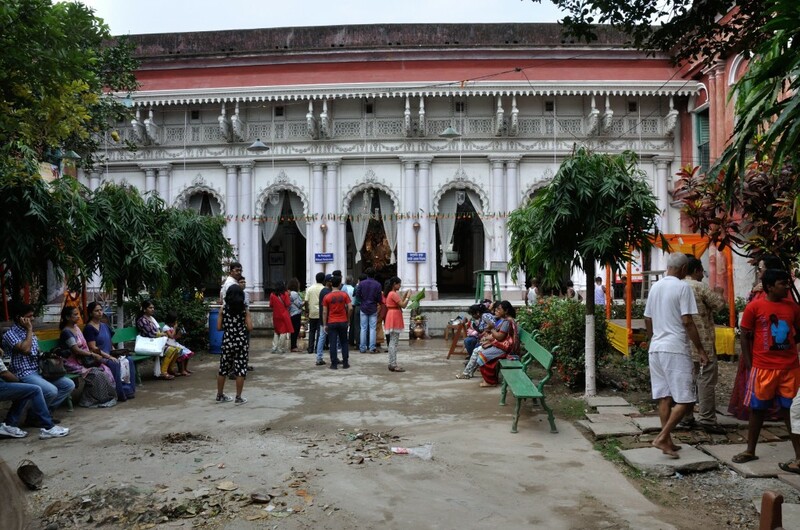 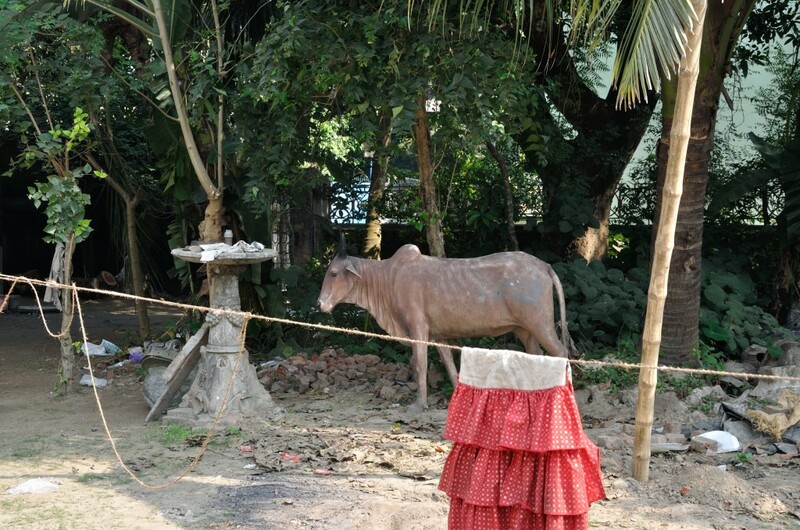 Waiting outside the Rajbari for the pandal viewing to begin later that evening. 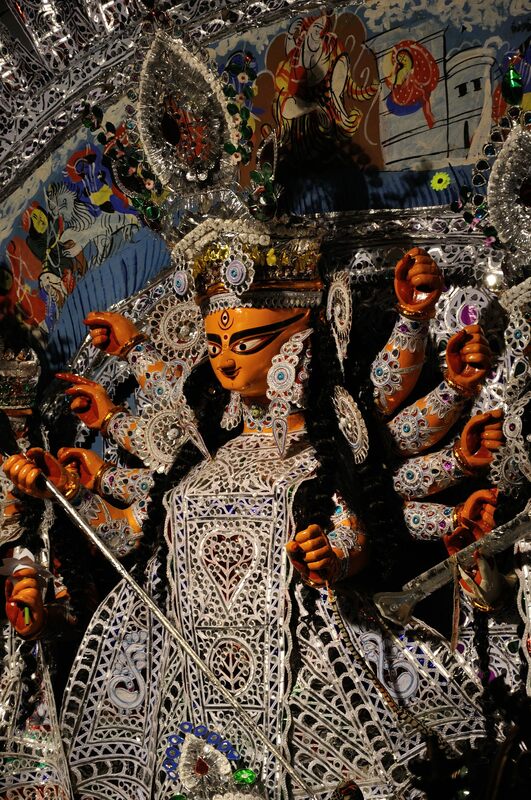 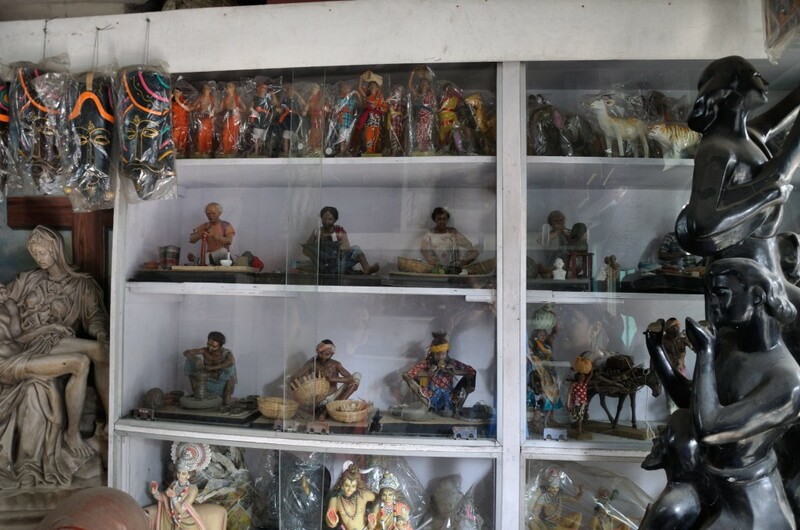 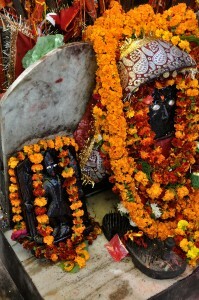 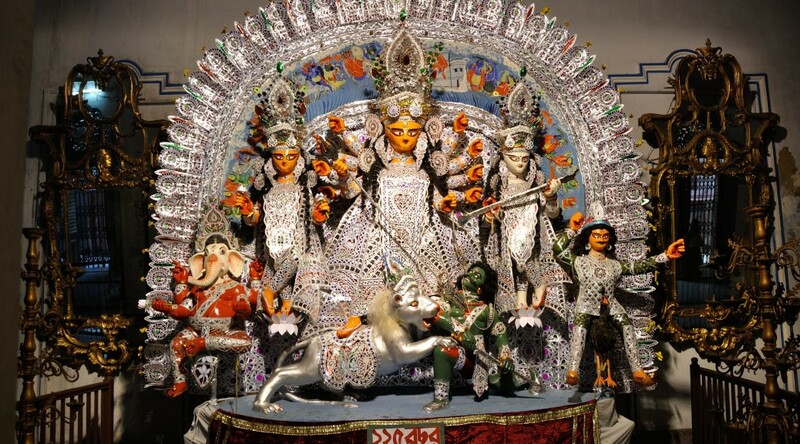 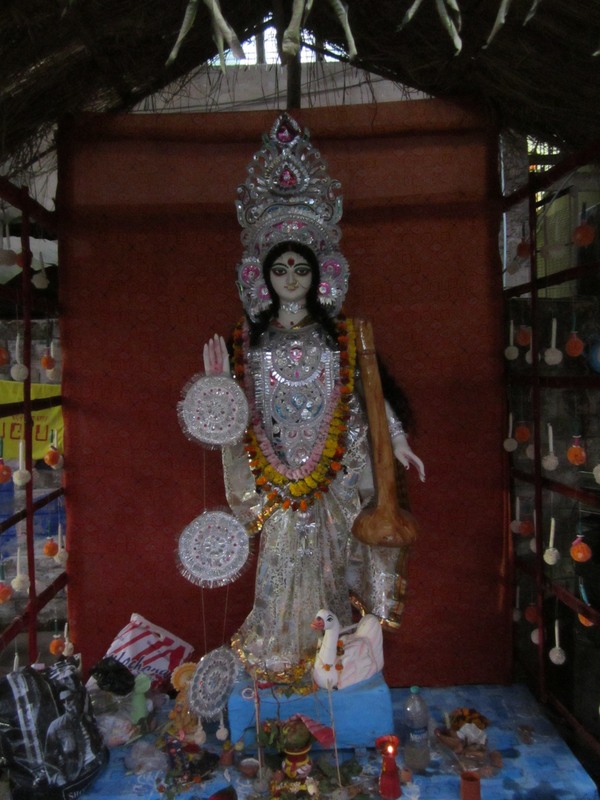 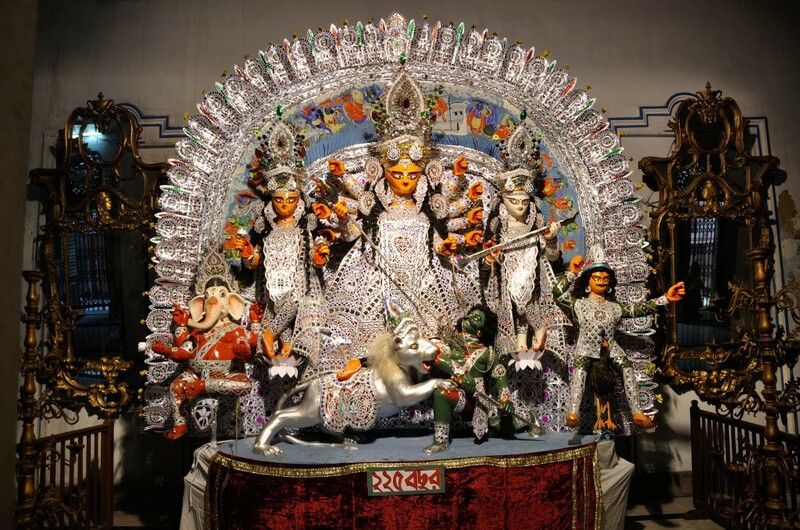 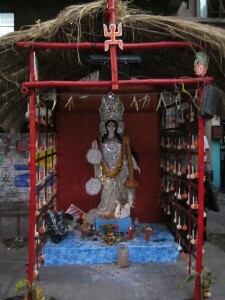 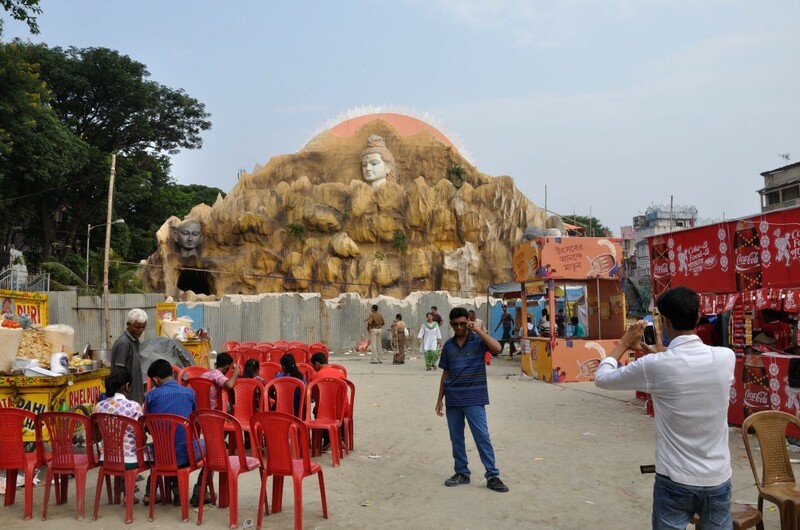 The Durga pandal with all of the clothing, headdresses, jewelry and other props, except – Durga’s hands are yet to be holding their ten weapons. 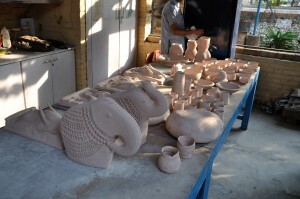 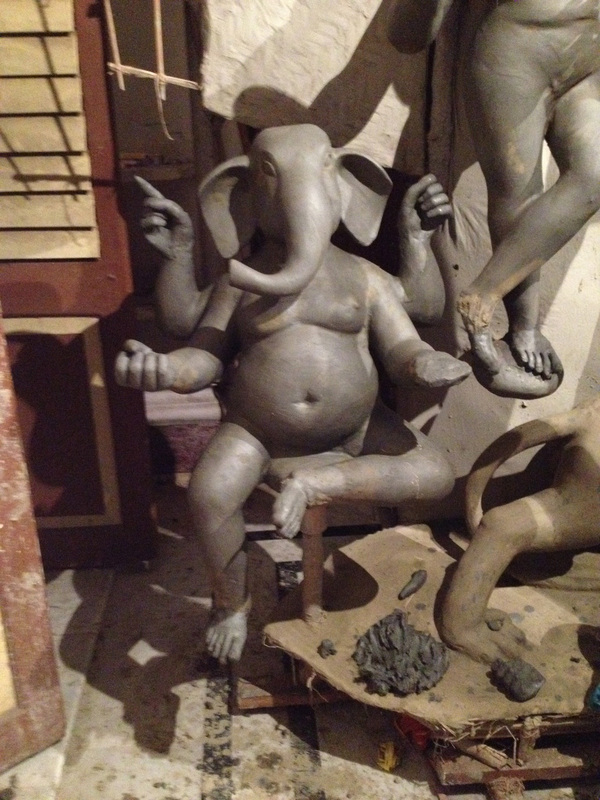 Here’s the Ganesha, side by side with his earlier photo! Inside, a contemporary rendition of the Durga scene using near life-sized figures (sadly, some other pandal hoppers’ heads are blocking my view of Kartik and Ganesha). 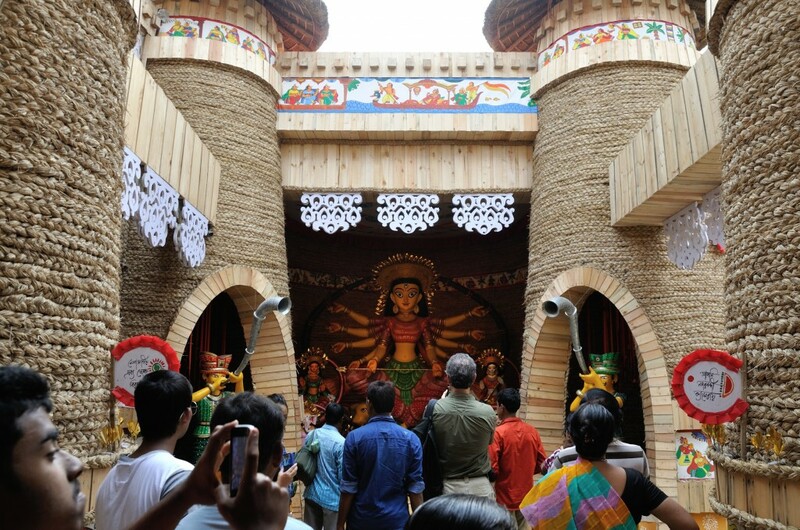 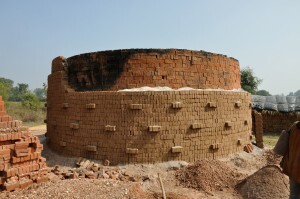 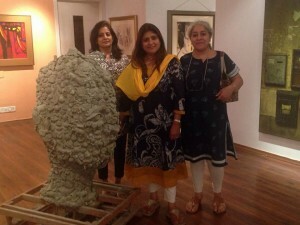 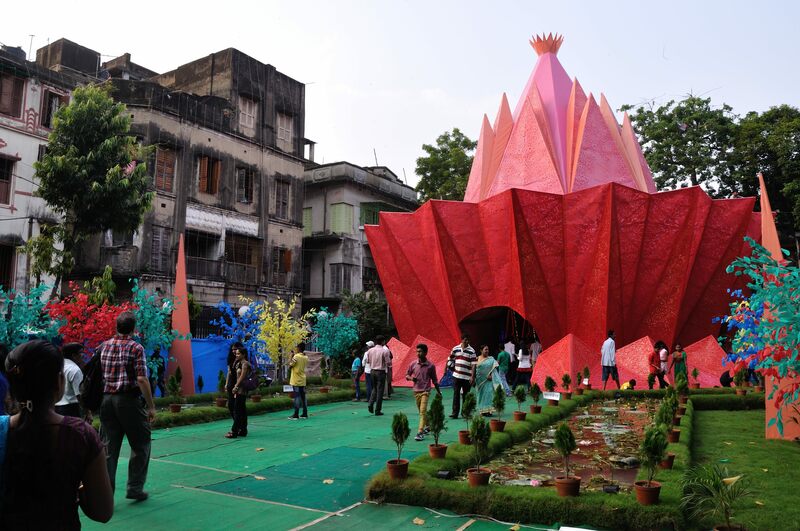 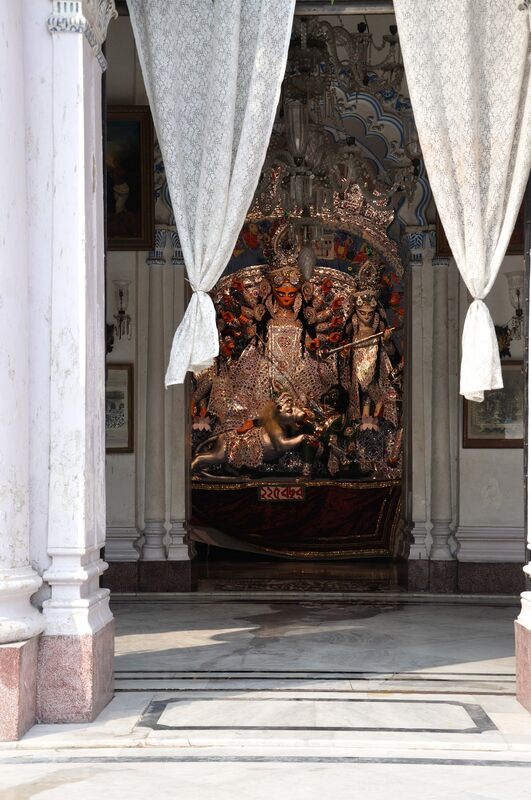 At the foot of this installation is a tiny traditional Durga pandal. 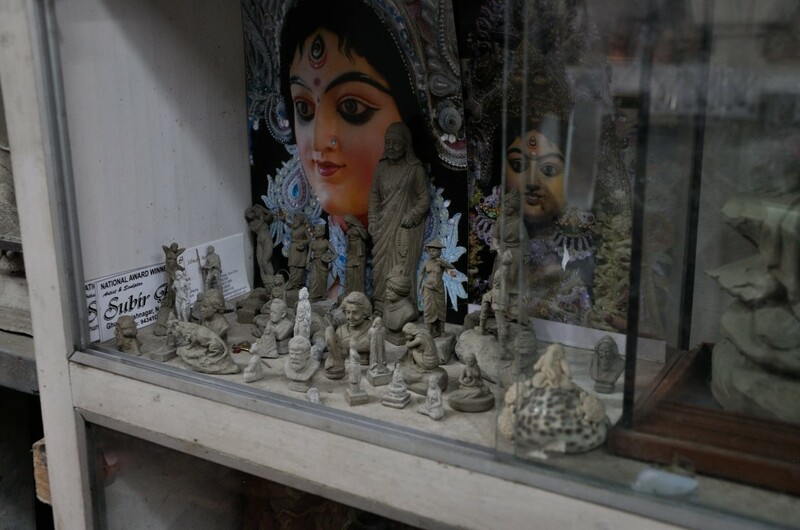 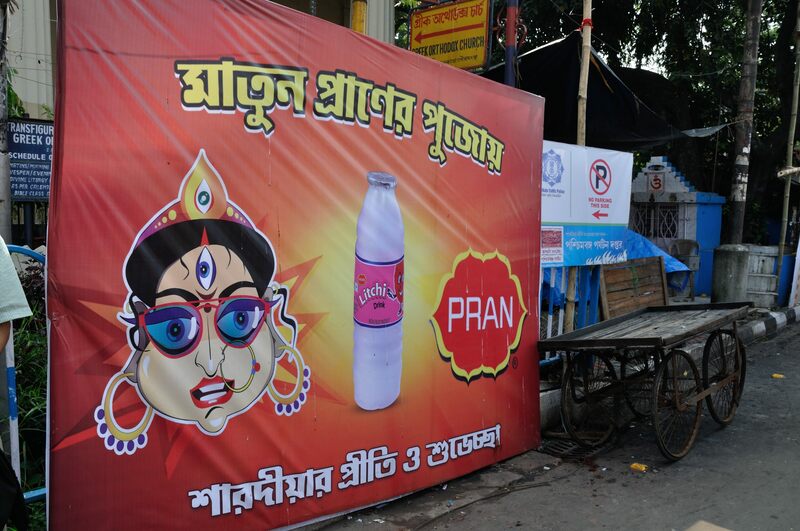 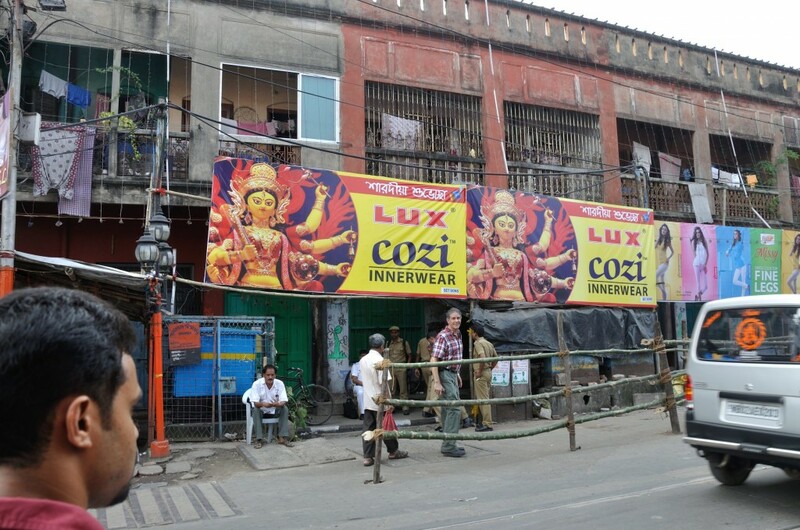 Around Kumartuli and pretty much everywhere in Kolkata, you will find advertisements using Durga to sell products and services. These photos show ads selling underwear, health care, and food. 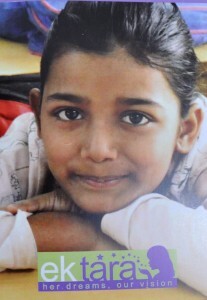 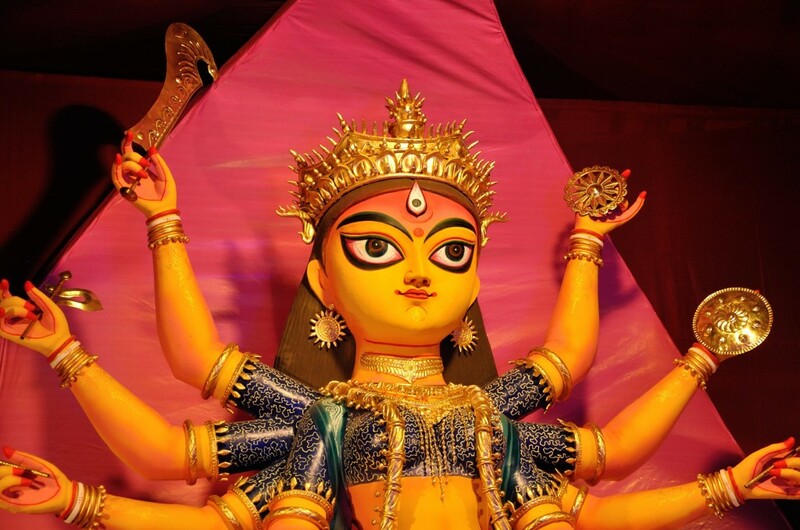 This Durga has a cartoon-character quality. 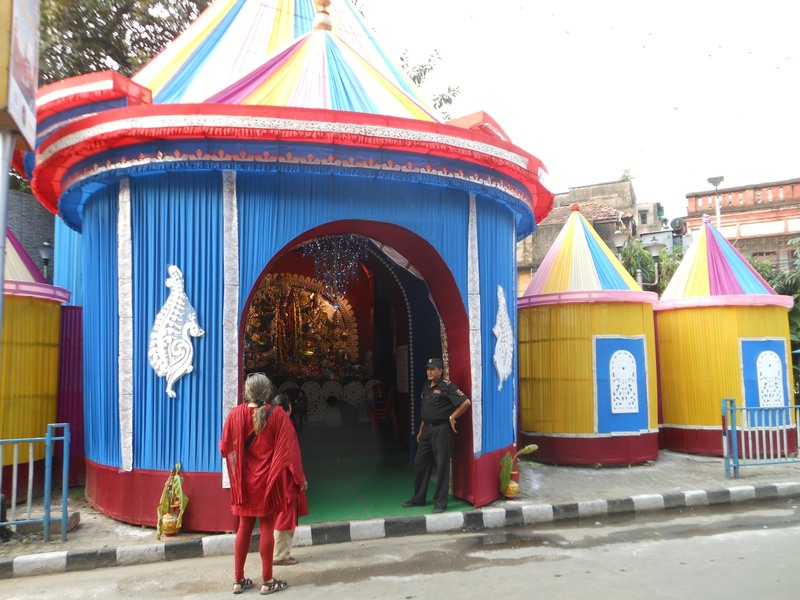 On our way back to the metro, we stopped to check out one more traditional community pandal, tucked into a lane. 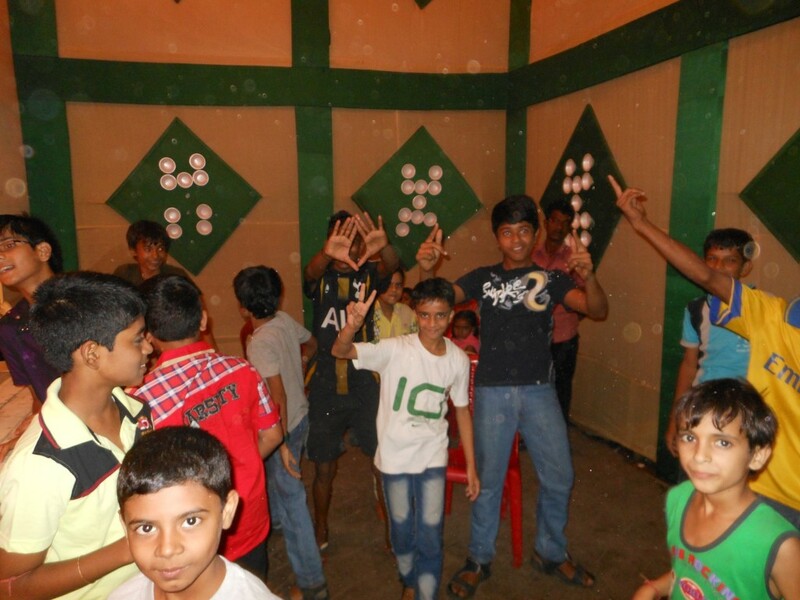 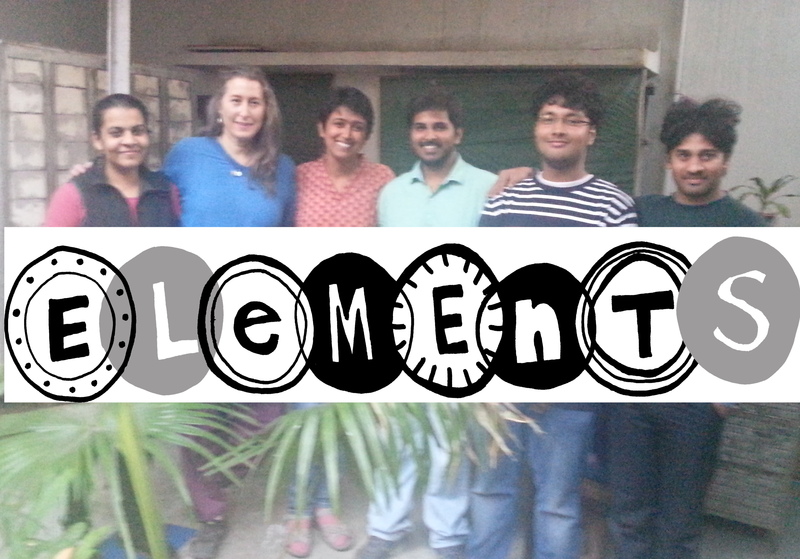 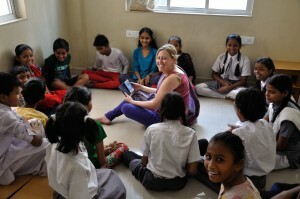 It was full of energetic and exuberant children! 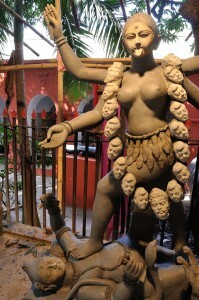 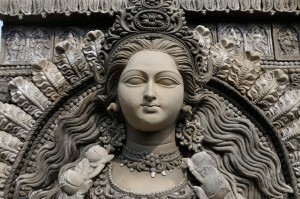 Their Durga is below. 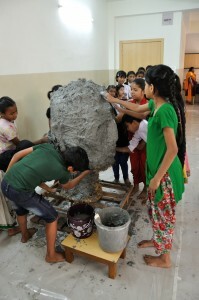 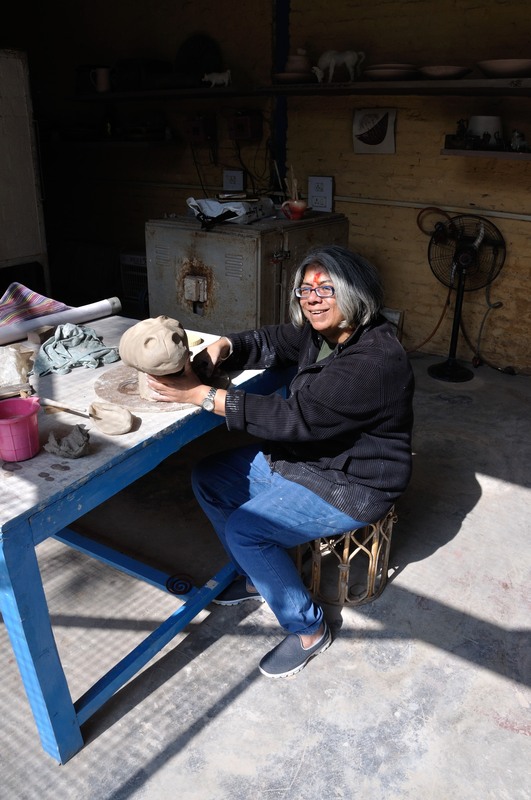 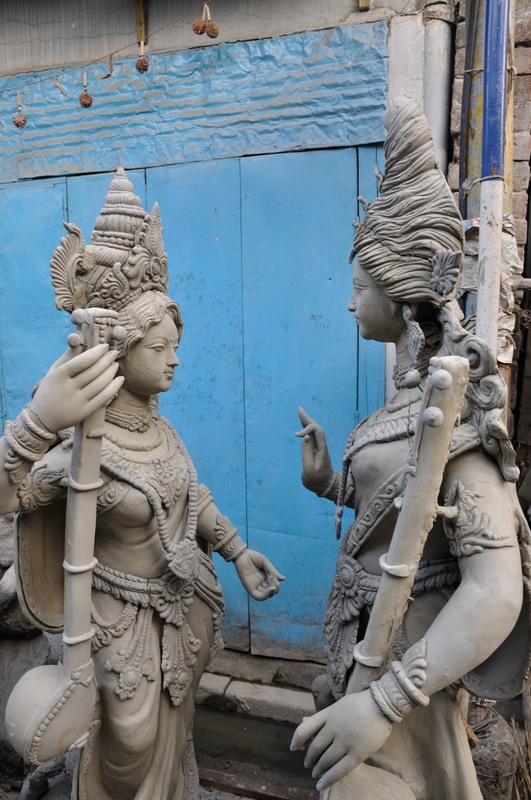 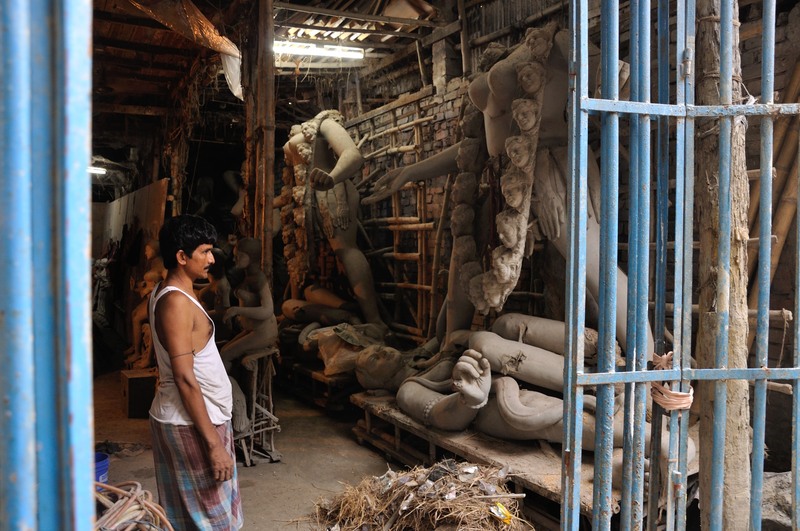 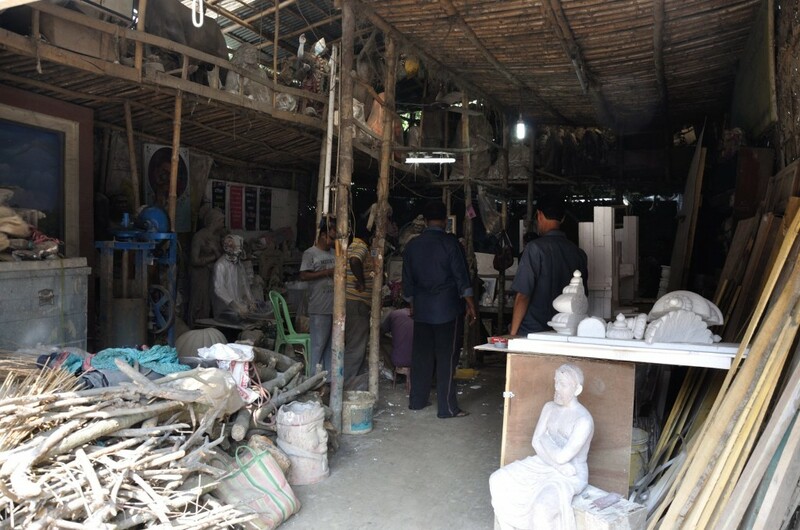 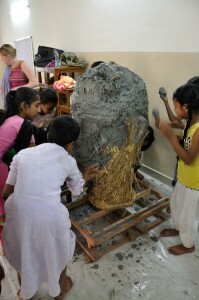 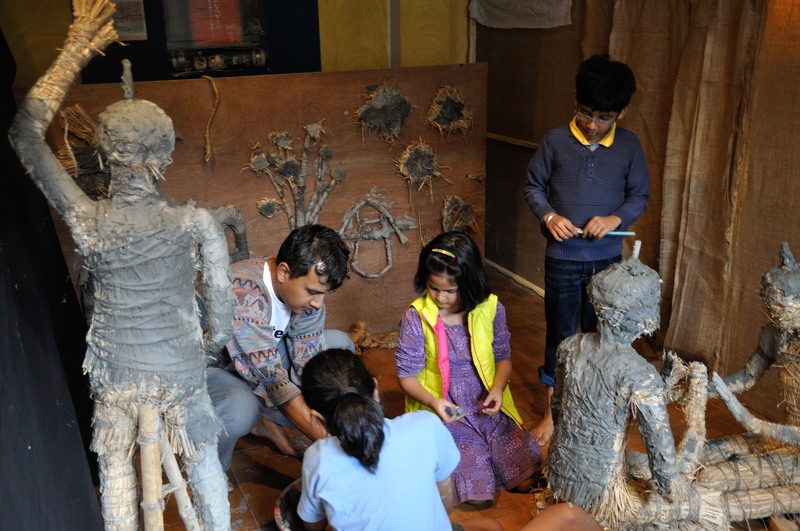 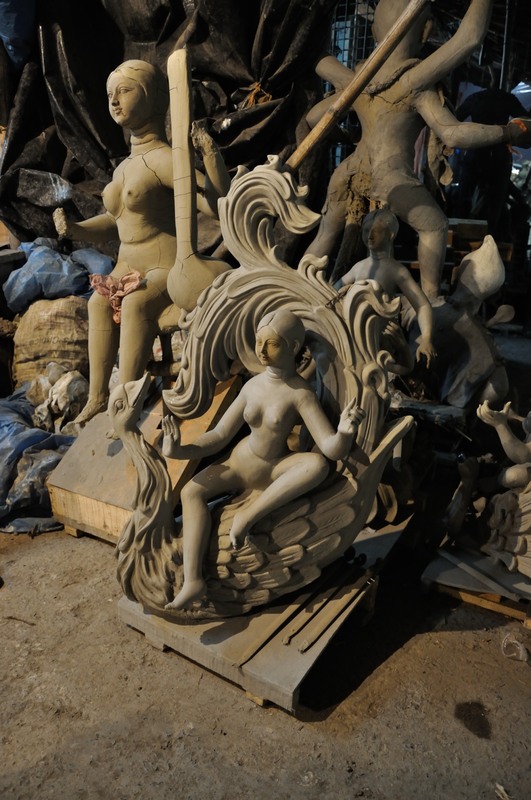 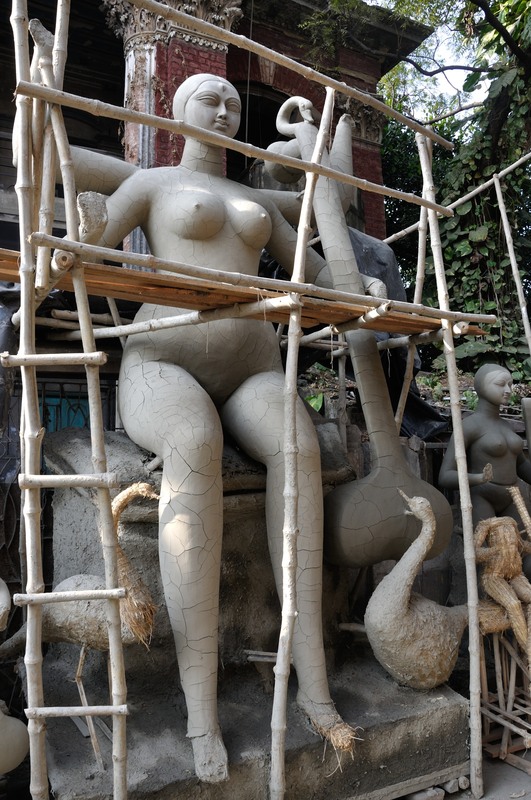 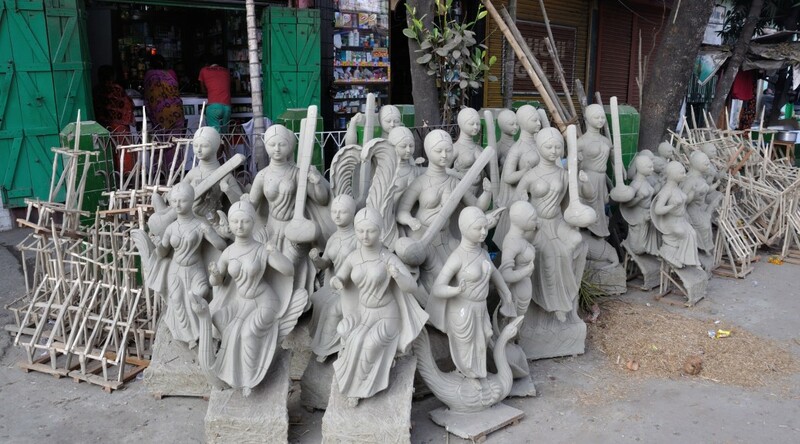 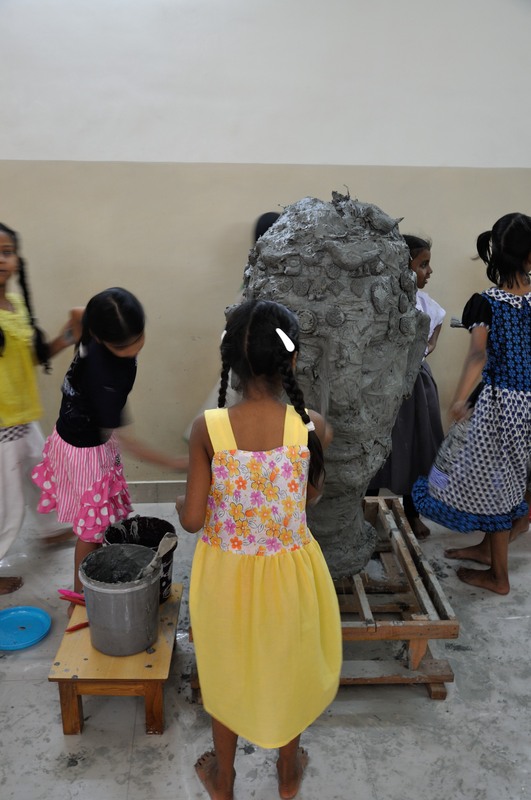 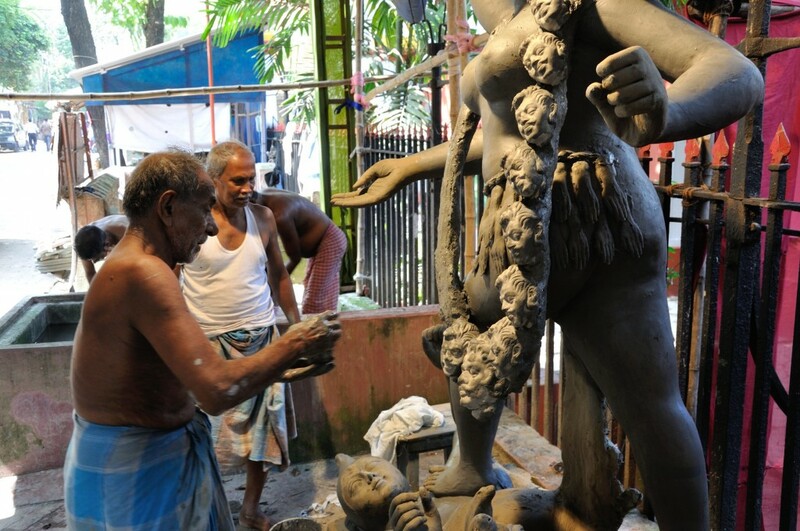 When we peeked into some of the Kumartuli workshops, some image-makers were already hard at work on gigantic pandals for Kali Puja, which takes place in a few weeks’ time.